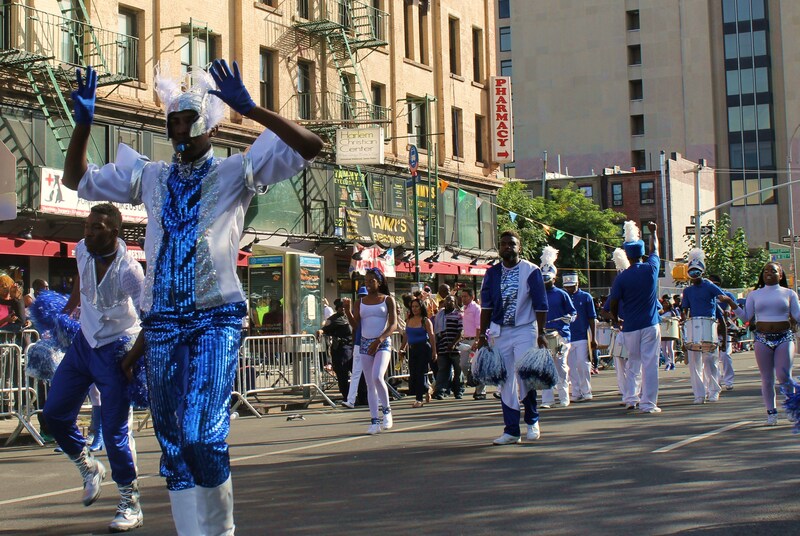 The second leg of the big weekend parades went down up in Harlem this past Sunday. 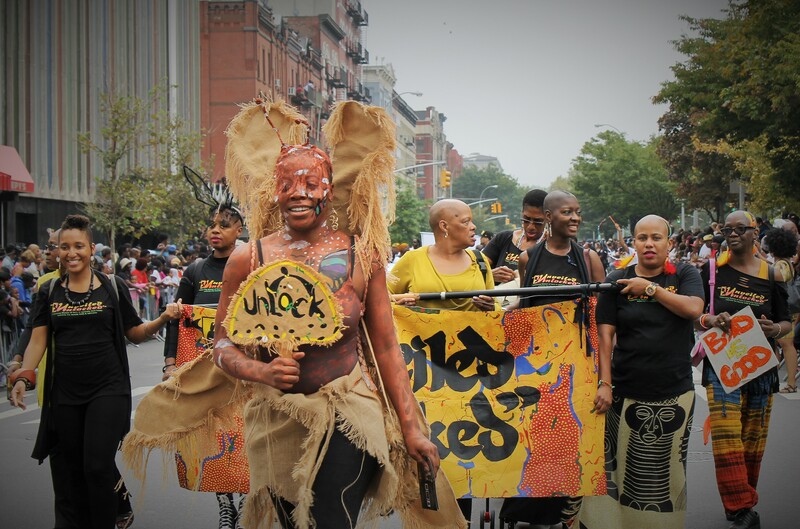 In a sharp contrast to the polite Steuben parade of Saturday, the 49th annual African American Day parade was boisterous with both marchers and revelers screaming with joy, love and happiness. 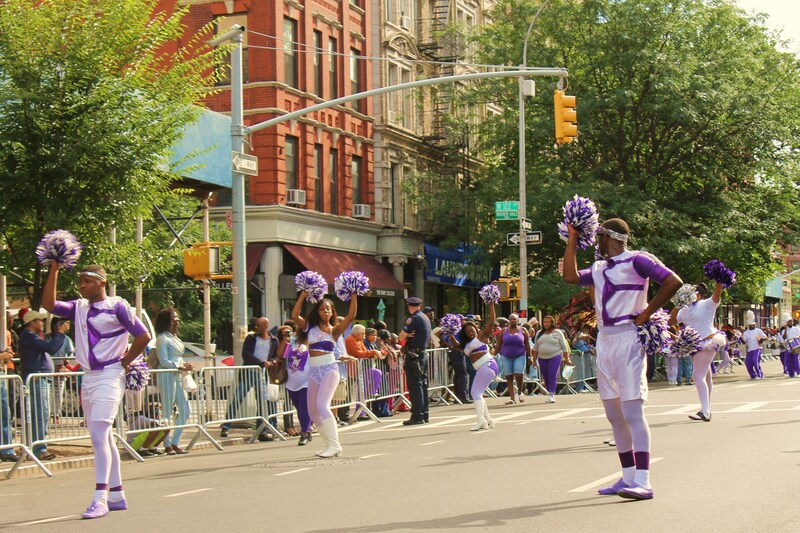 Billed as the largest parade of its kind in the country, the African American parade displays lots of pride and enthusiasm for all the contributions made to the nation and to the great city of New York. 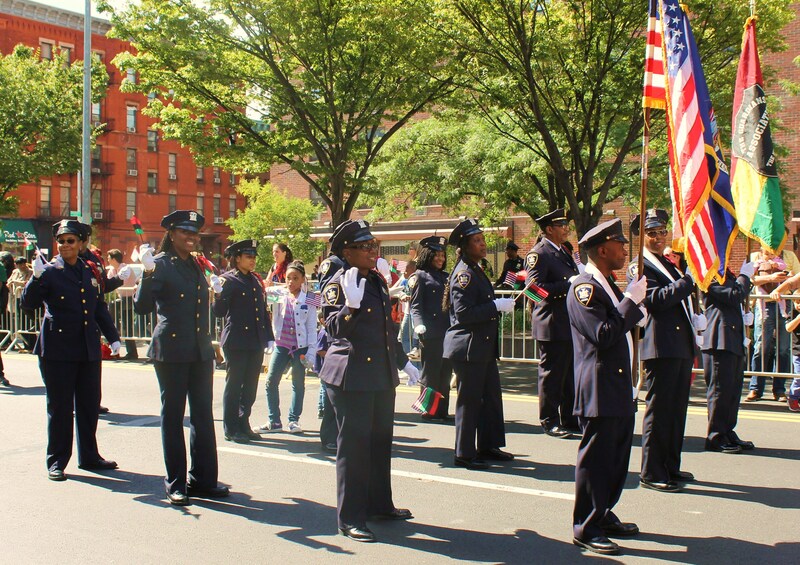 Crowds were filling up along the parade route on Adam Clayton Powell Jr. Blvd. 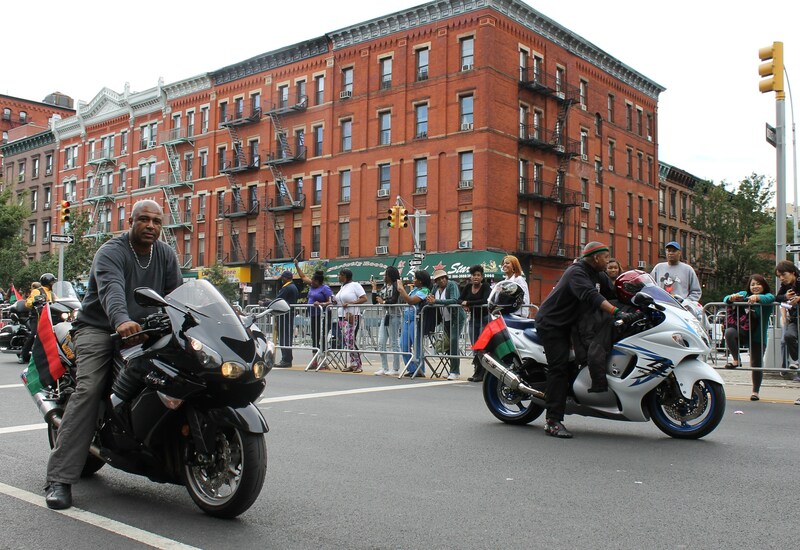 from 111th St. up to 135th St. The warm weather brought out close to 1 million people waiting to cheer on the marchers that came in from all parts of the country. 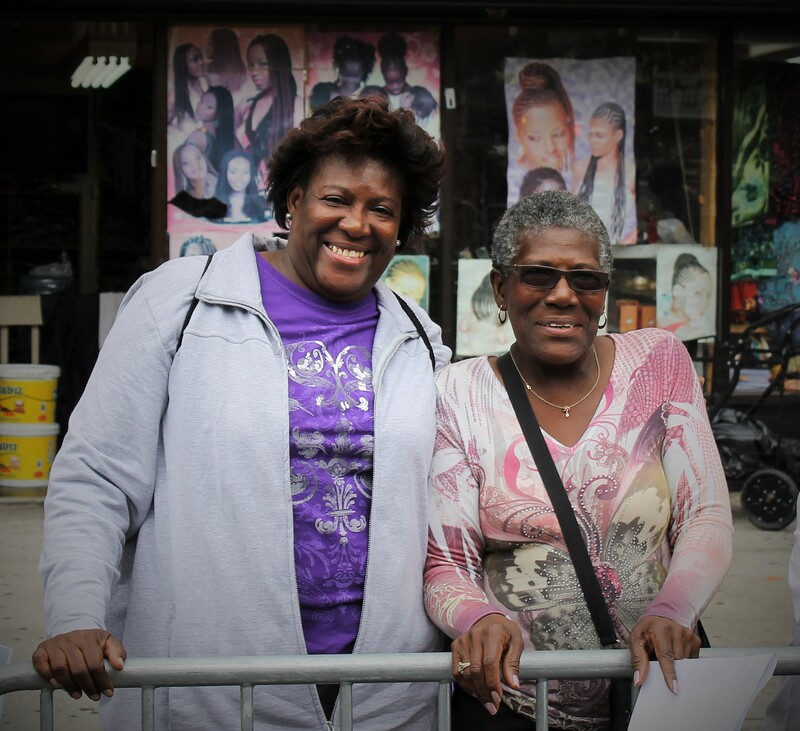 In the shadows of the world famous Apollo Theater on 125th St. and in front of the Adam Clayton Powell statue, a reviewing stand is set up for announcers to introduce the many hundreds of groups participating in the grand event. 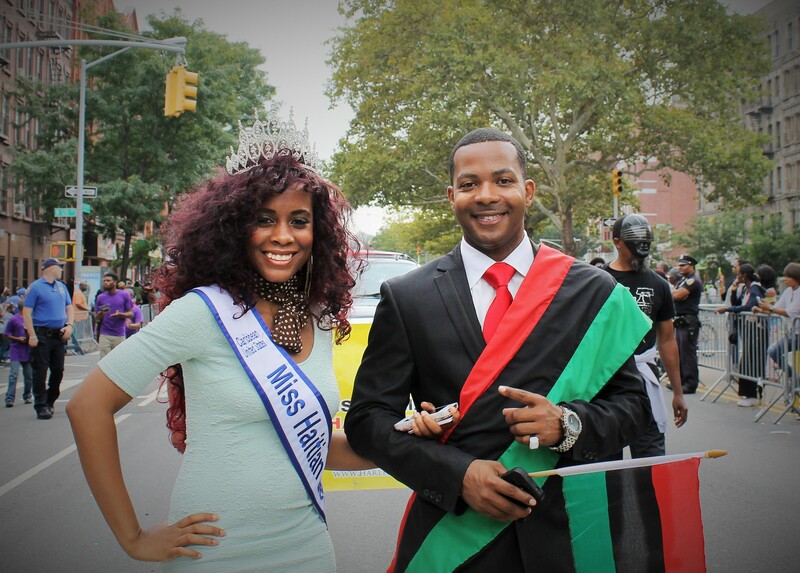 Local hip hop and R&B radio stations also simulcast the event to all their local and worldwide listeners. 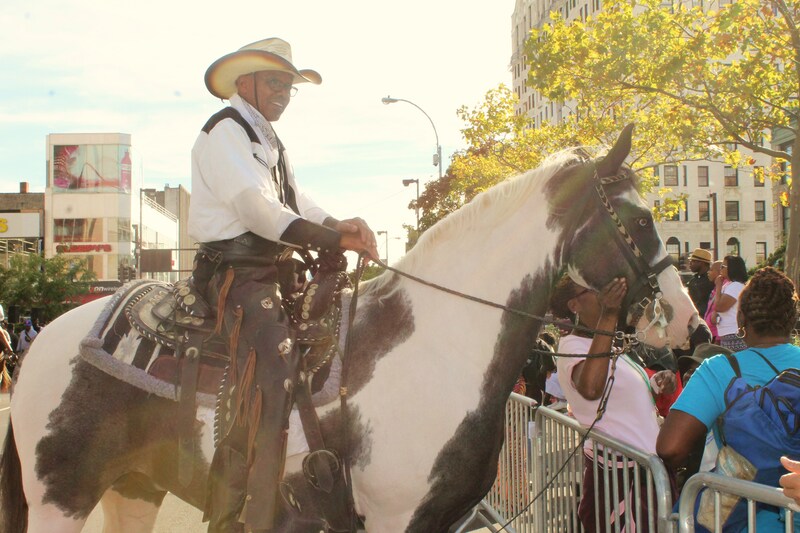 As usual, the mounted police signaled the start of the parade. 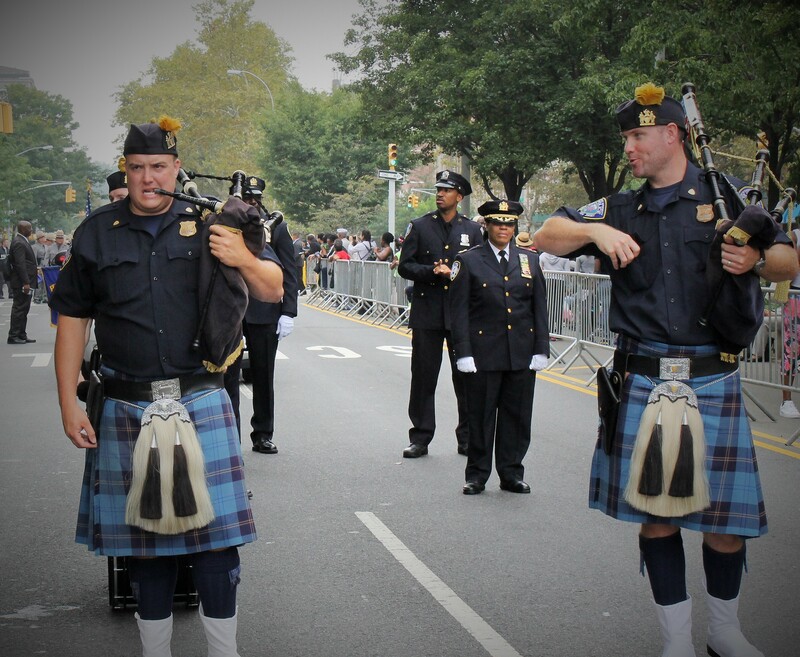 Parade dignitaries and VIPs made their way to the reviewing stand in what would be an amazing day of celebration. 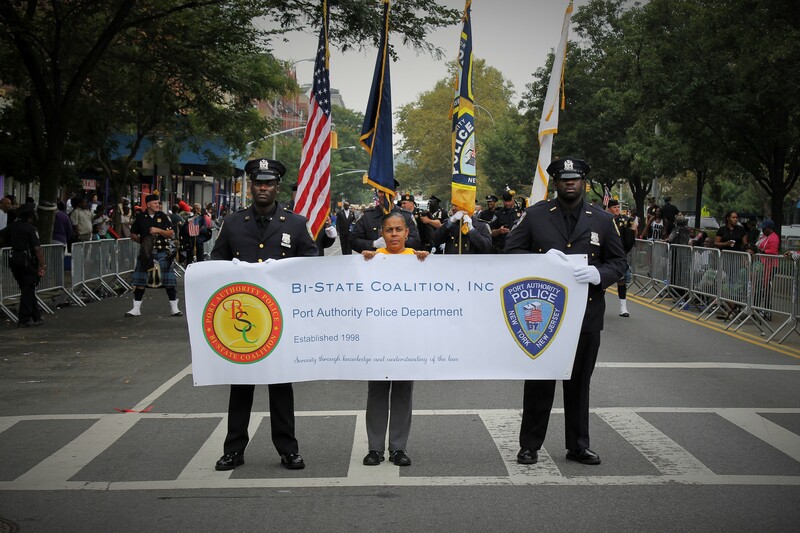 This parade has always been a platform to educate and raise awareness of issues affecting the community. 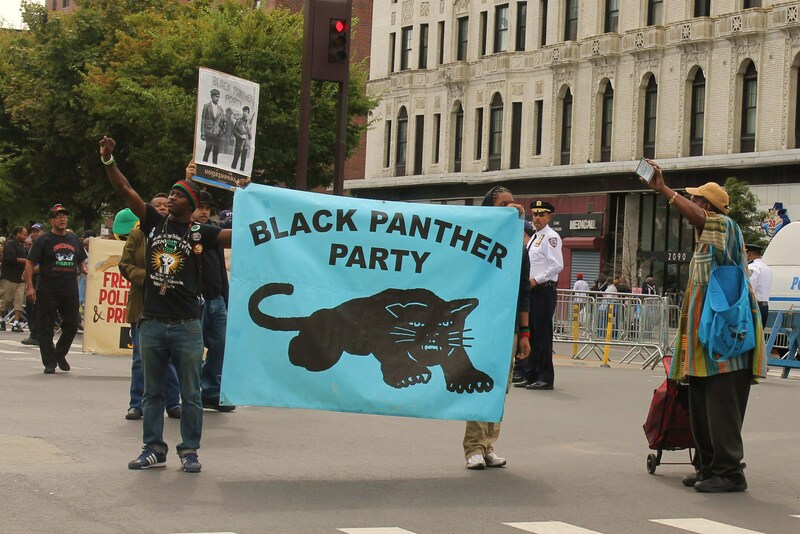 Marchers were eager to engage with people about issues like ending the school to prison stream and a call to end police violence and killing of unarmed minority citizens. 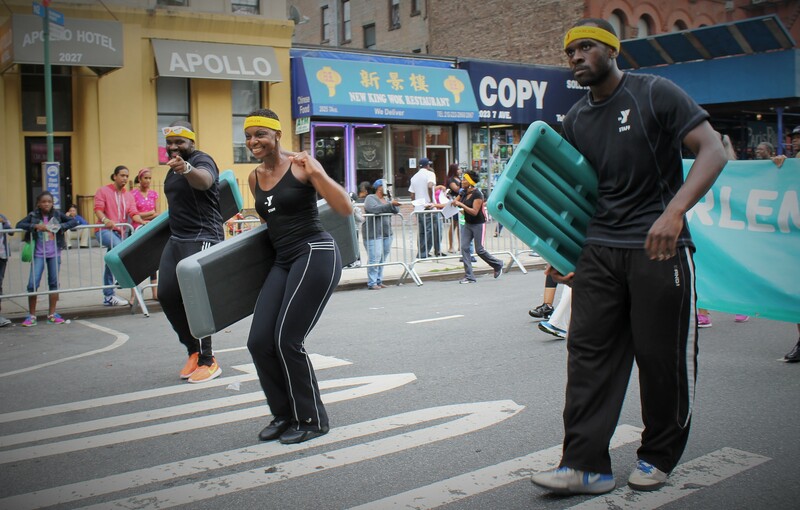 There were many groups calling of the community to get out and exercise no matter what your age. It really is a great day for community for all those present. Many floats passed by blaring old school and the latest hip hop hits. It was one big party. 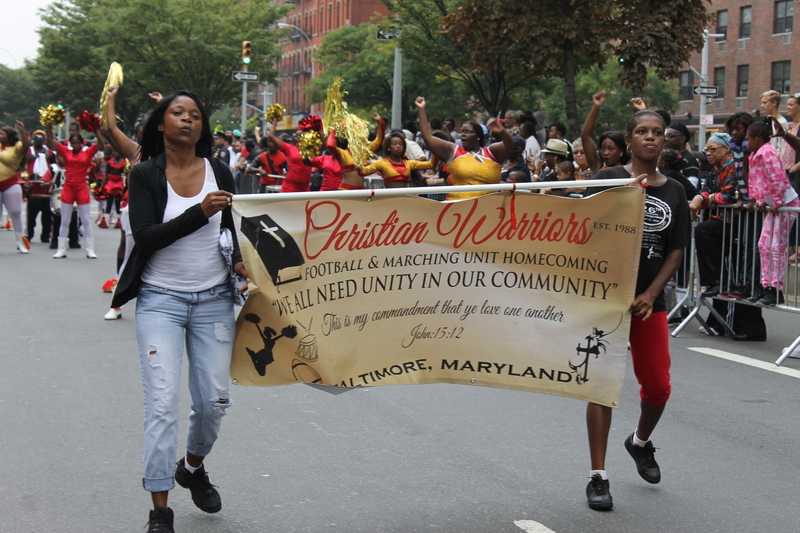 A more traditional marching unit came up from Baltimore in the Christian Warriors. 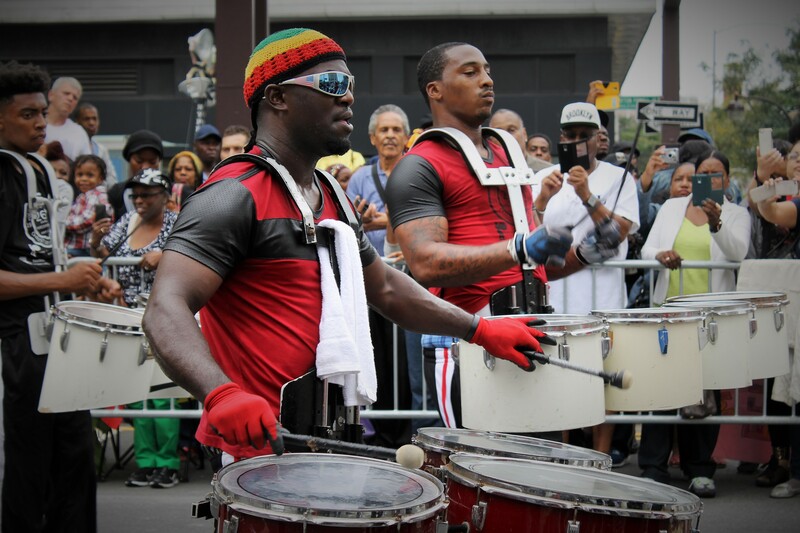 They always put on a good show and the drummers were on fire. 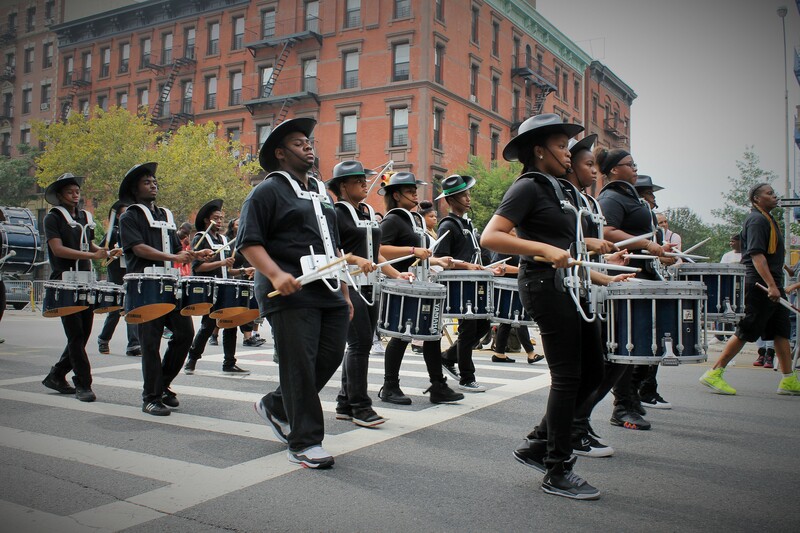 Of course a parade isn’t a parade without a marching band and Uniondale HS from Long Island, NY did a great job. Dancing groups came to show off their best moves. 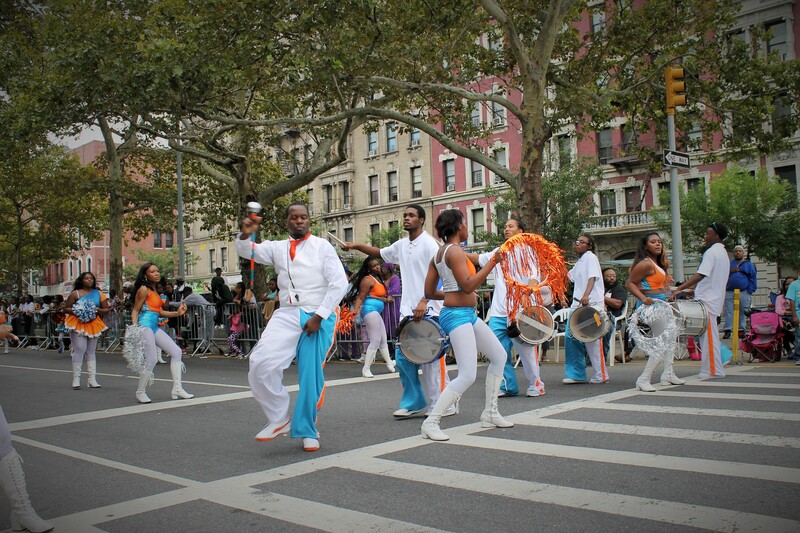 The Marching Cobras got things started with their stylish moves. One of the best dance groups were the Sugar Babies. 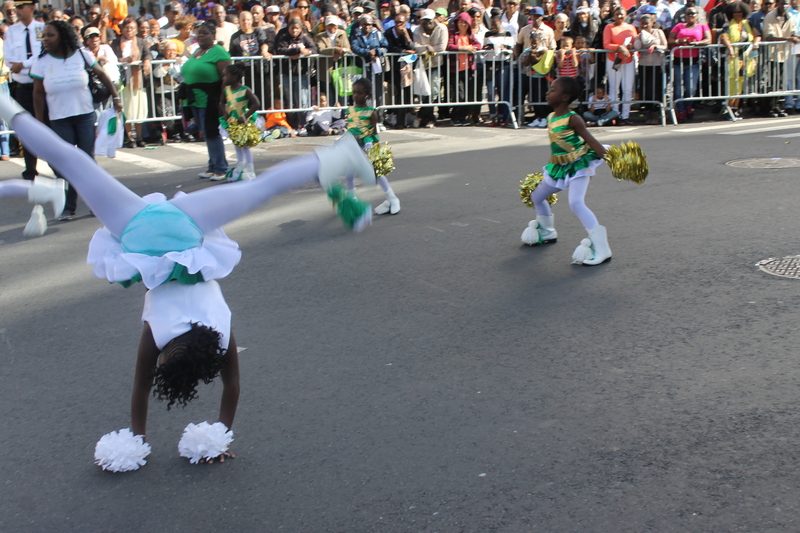 They had female dancers break out moves that had them standing on their head. Amazing. The fraternity and sorority houses represented very well and had the most fun of all the groups. 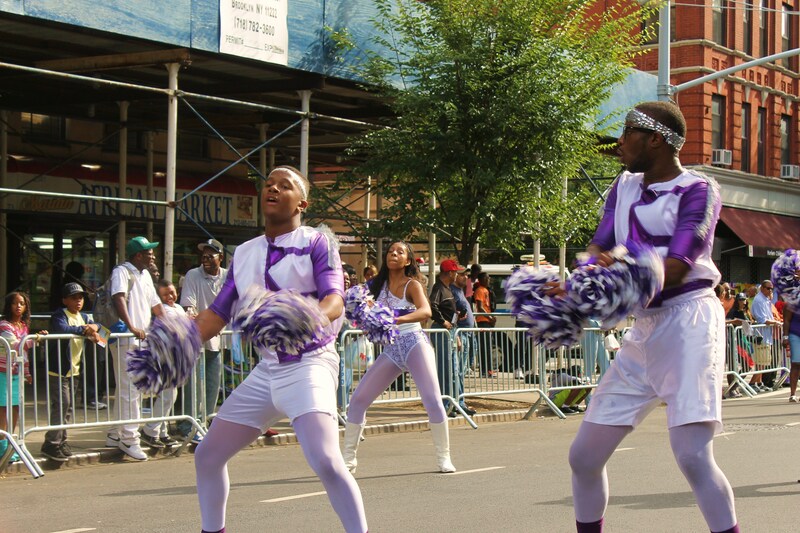 The last part of the parade always features the steppers from Baltimore showing off their swag. Perennial favorite Mass Destruction got things started with their high energy dancing. 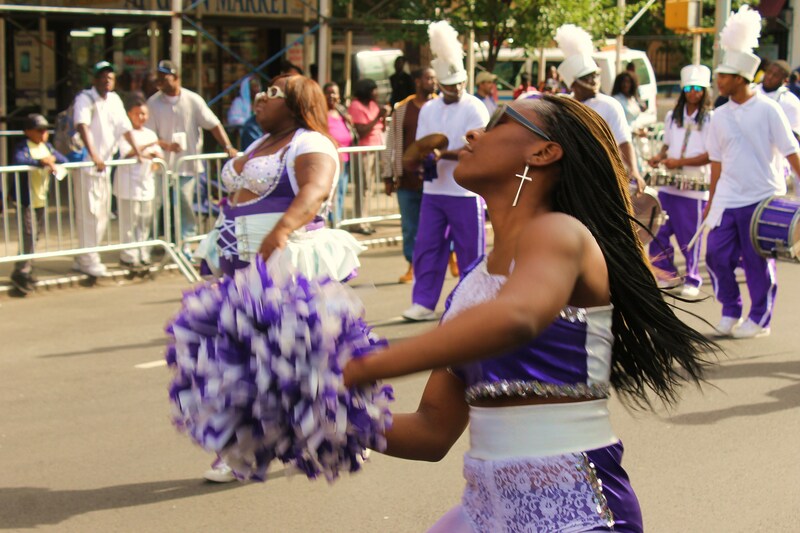 A new crew showed off some nice moves in the Epic Premier Marching Unit. They were soon followed by a really fun group. 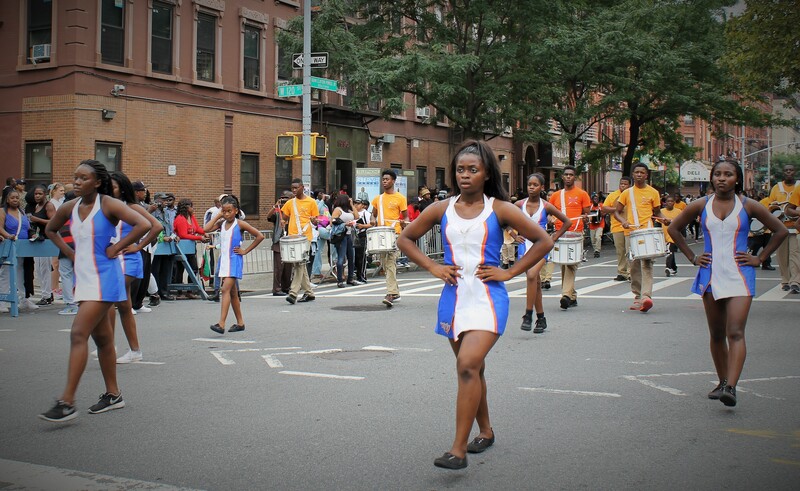 The Dynasty Marching Unit showed off some really good moves and gave the crowd a treat. 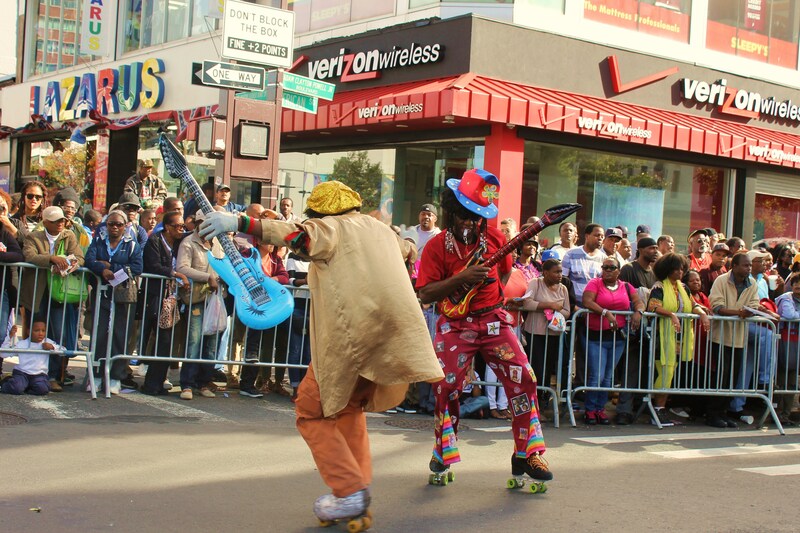 In this case, the best was saved for last when the Baltimore All-Stars tore it up and sent the crowd home happy. 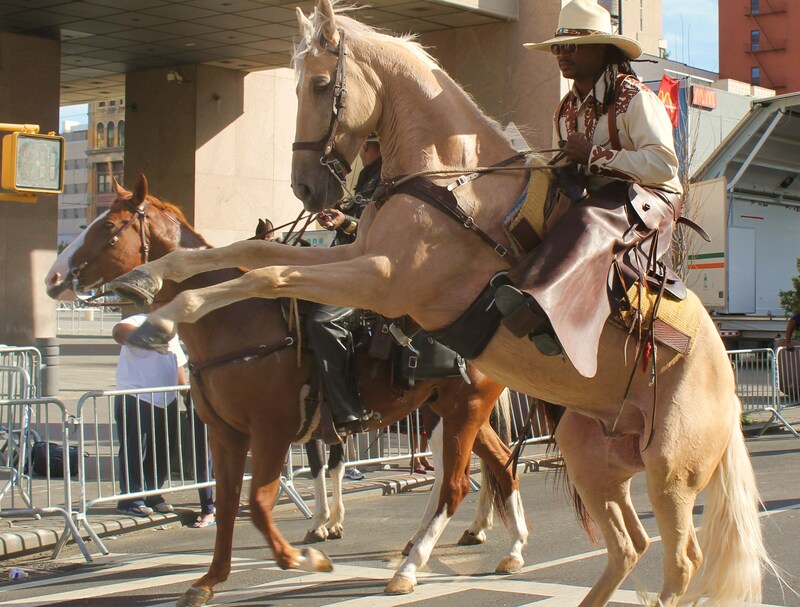 This really is a great parade to attend and if you haven’t seen it…add it to your bucket list. It’s a must see. 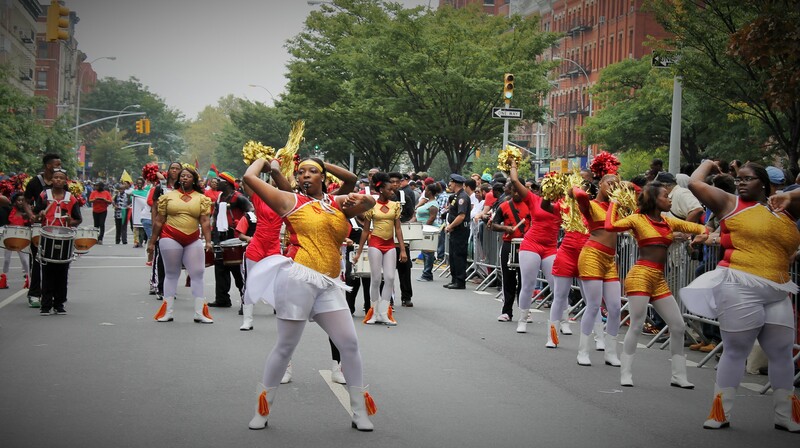 The second leg of the big parade weekend turned out in Harlem for the 48th annual African American Day Parade. 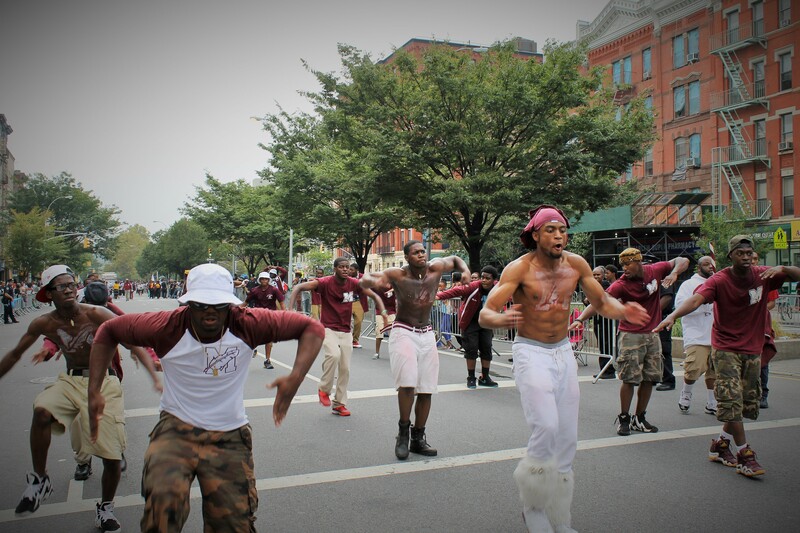 Billed as the largest parade in the nation celebrating Black culture, talent, and contributions to the fabric of this country, this years edition did not disappoint. 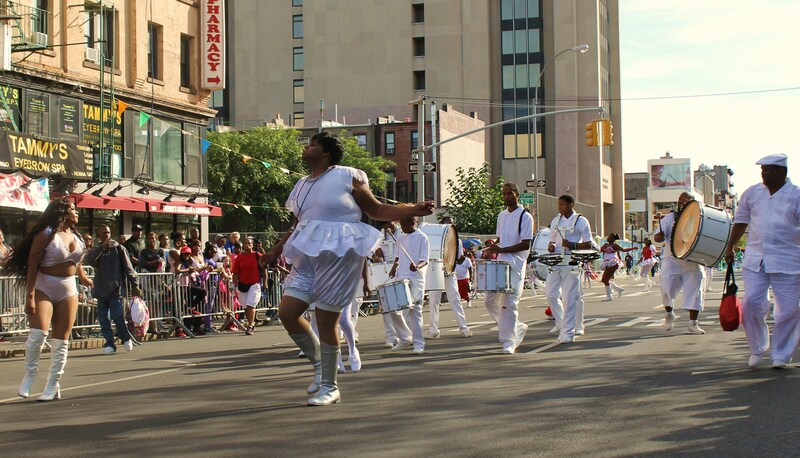 Another hot day invited well over 800,000 spectators to fill up the parade route on Adam Clayton Powell Jr. Blvd from 111th to 135th Sts. 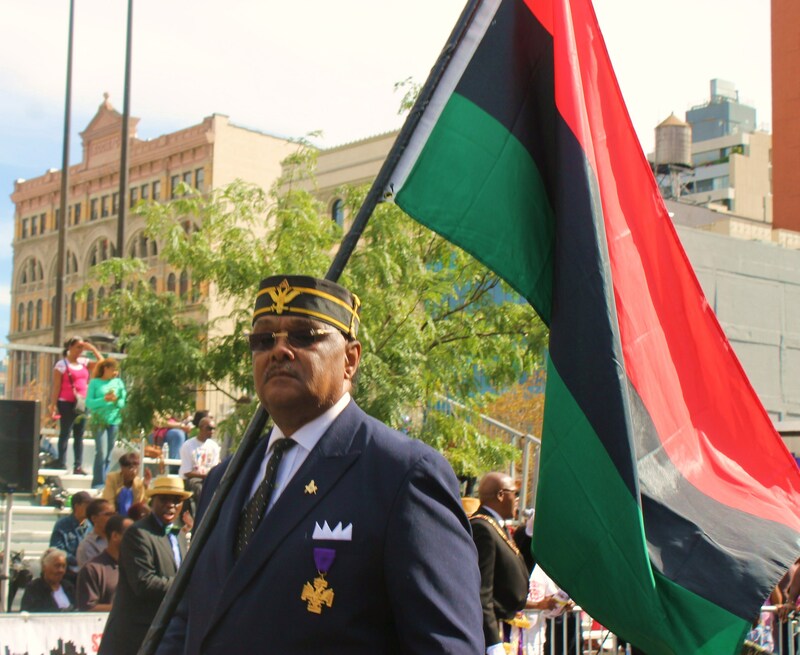 The reviewing stand on 125th St near the shadow of the famous Apollo Theater was filled to capacity. 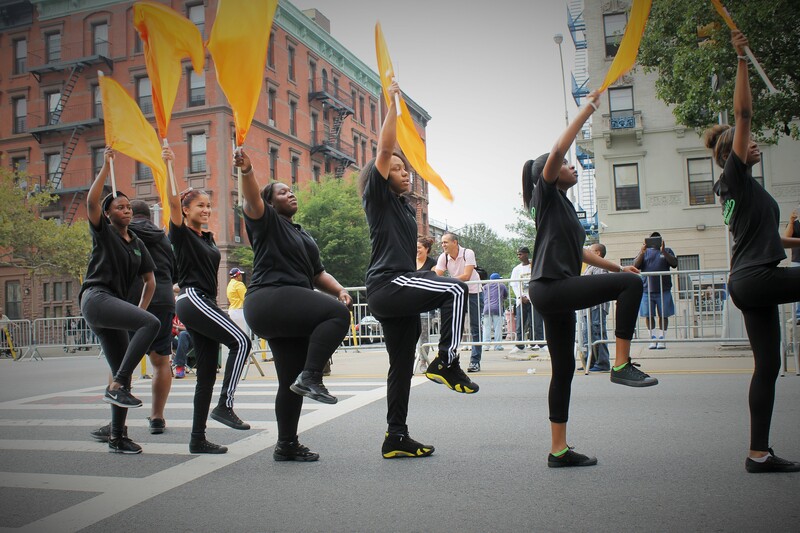 This year, announcer Yasmin had her hands full with the hundreds of groups that participated. 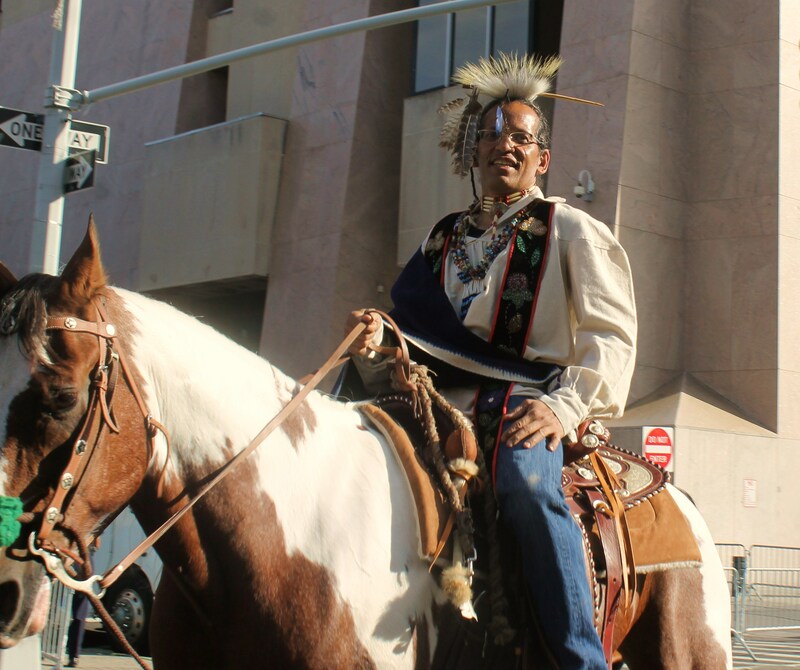 Some groups came as far as California to share in the celebration. Kicking things off were the Hillside NJ Blue Thunder group with a real nice introduction to what would be a fun filled day. 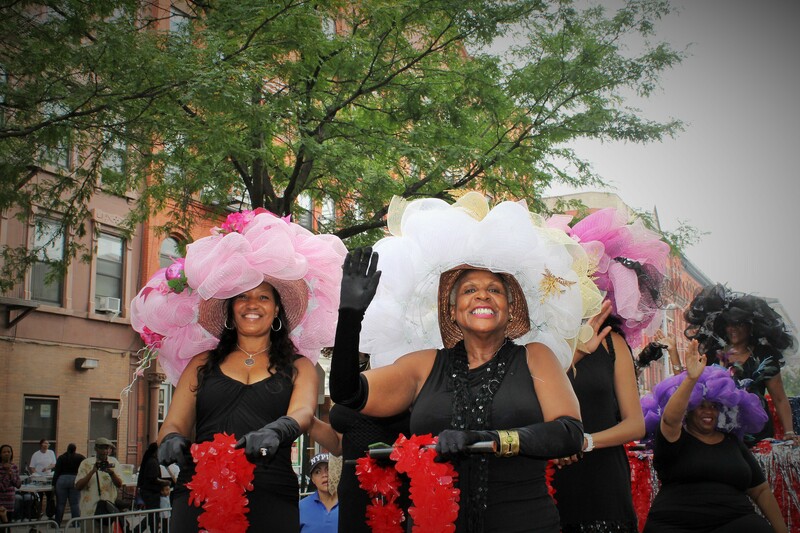 This years parade theme is “Salute To A Better Health” with lots of health related grassroots groups helping raise awareness. 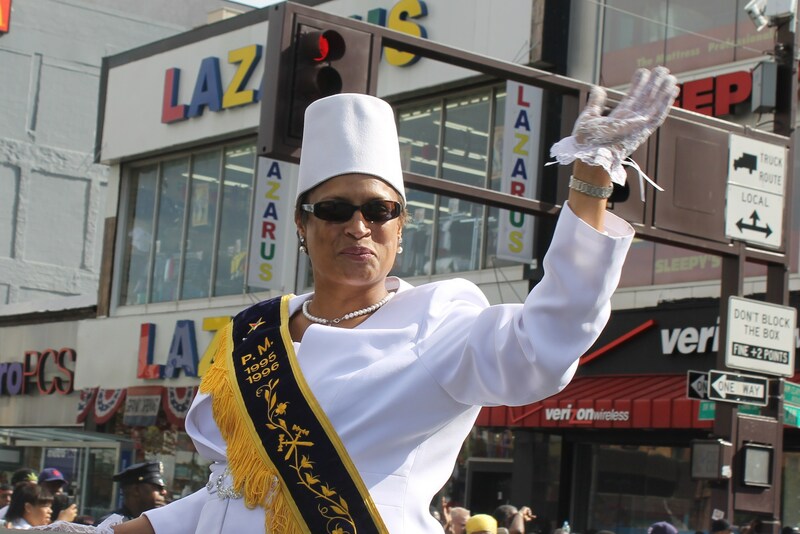 This years Grand Marshalls are all prominent physicians and health professionals dedicated to promoting healthy lives. 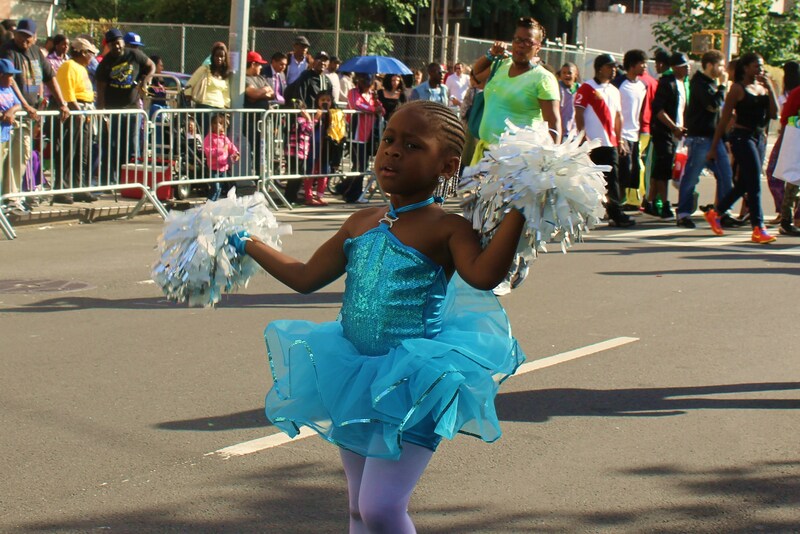 This parade more than any other does promote social agendas to help raise awareness of issues the people of this great city are facing. 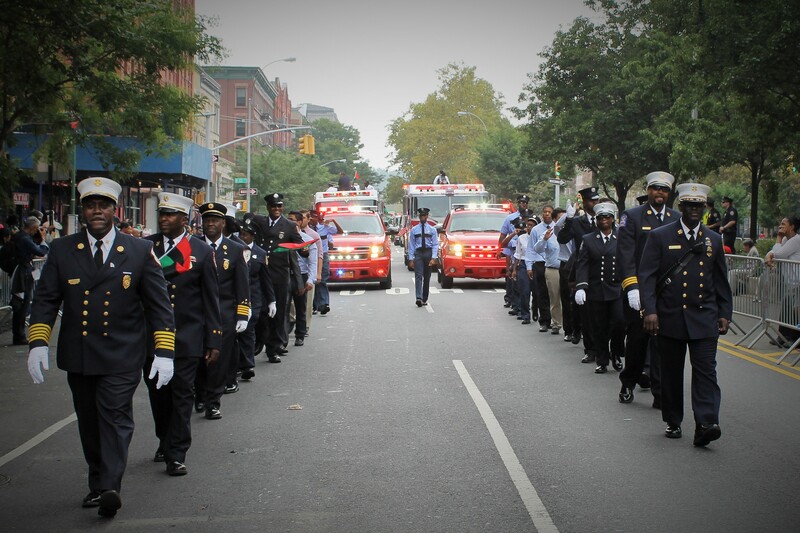 It’s really inspiring to see so many groups follow in the words of Adam Clayton Powell Jr…”If you believe in cause you must be willing to put yourself on the line for that cause”. 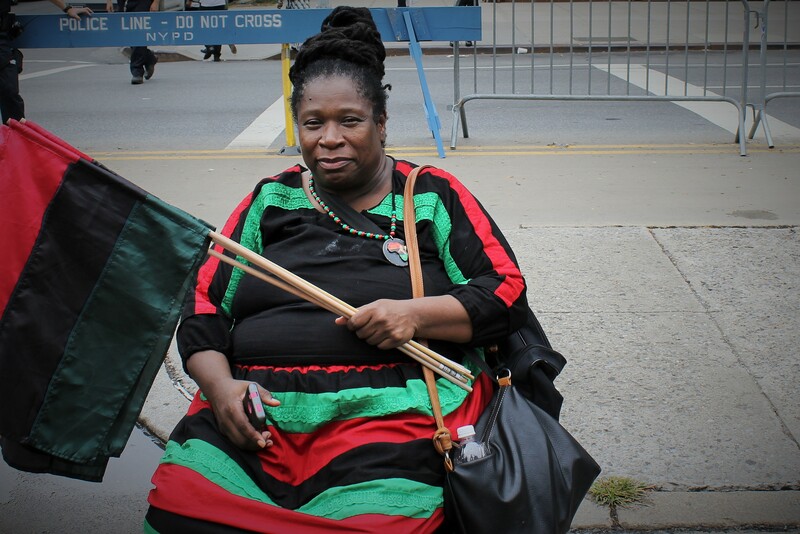 A long time activist, Dr. Lenora Fulani, was getting the crowd for NYCHA to stop pushing out the poor all worked up. NYC is facing a housing crisis. Gentrification over the last 30 years has pushed people out of their long time homes for “market rate” housing. Although NYC Mayor Bill DeBlasio has been a proponent of affordable housing since his administration began, the tide has been clearly set against the poorer residents as landlords look to gain at the expense of others. With a small army of activists, some of the marchers were spreading the word on taking action to prevent further displacement. It was great to see organizations like the Vulcan Society Inc, a group of firefighters and EMTs that support community outreach programs and help recruit youth into careers as firefighters and paramedics. 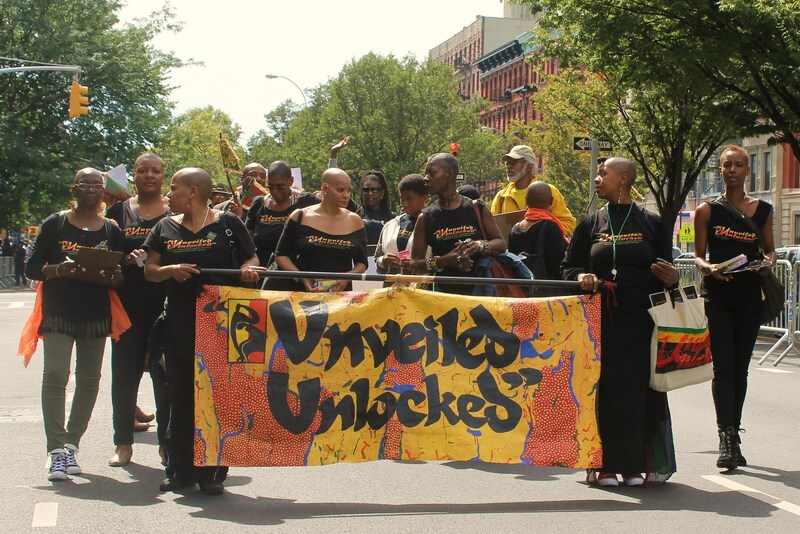 A grassroots group that is taking matters into their own hands is the I Am Peace Movement. 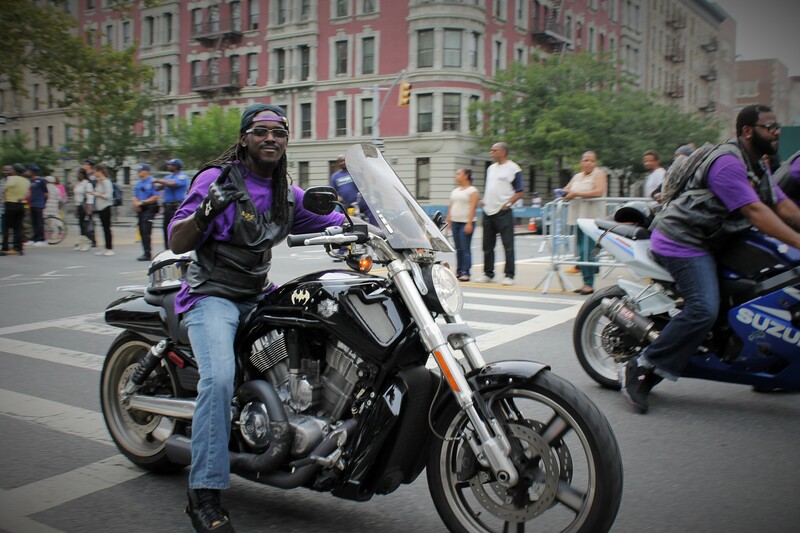 They work in conjunction with hospitals to reach out to the community about empowering youth. 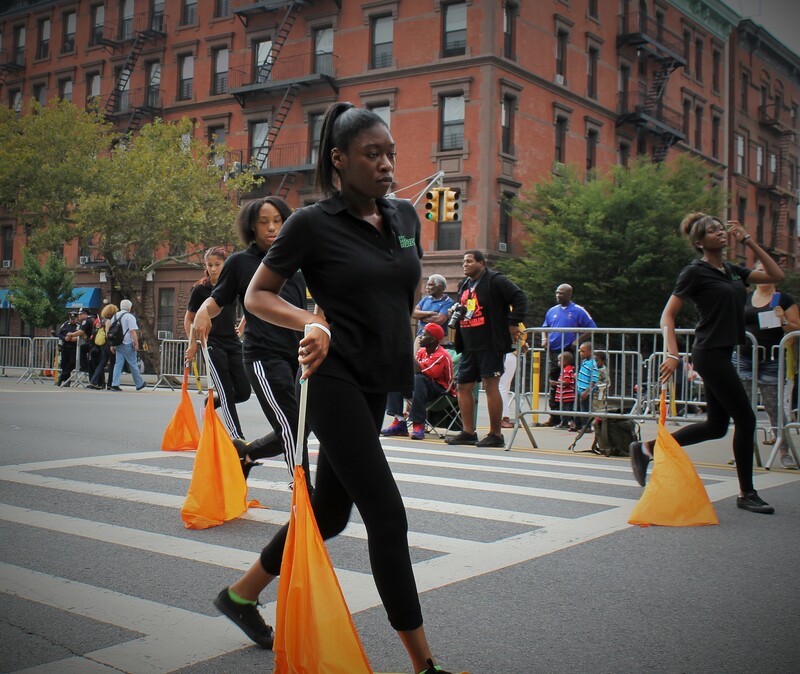 Girl Trek was on beat promoting women to put on their walking shoes and get out and walk. 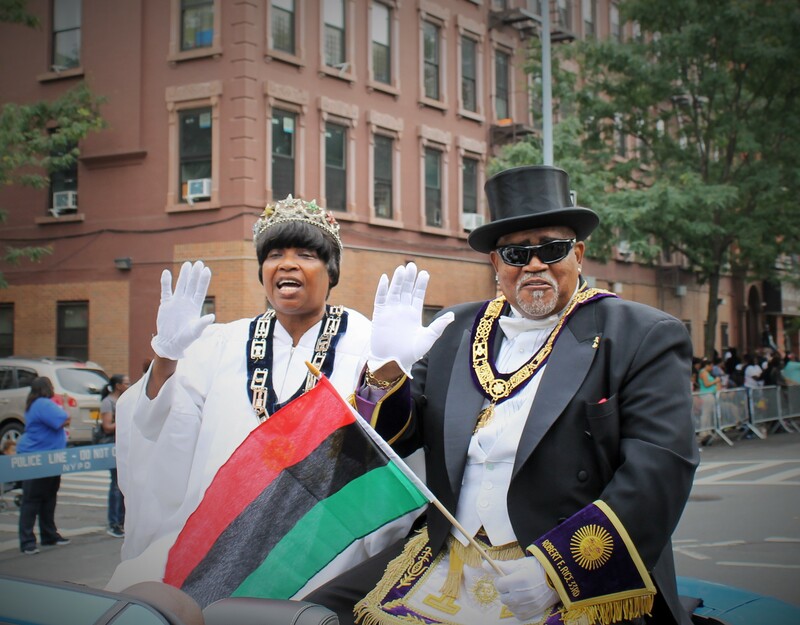 One of the largest groups participating was the Egyptian Masonic Order of the United Nuwaupian Nation. 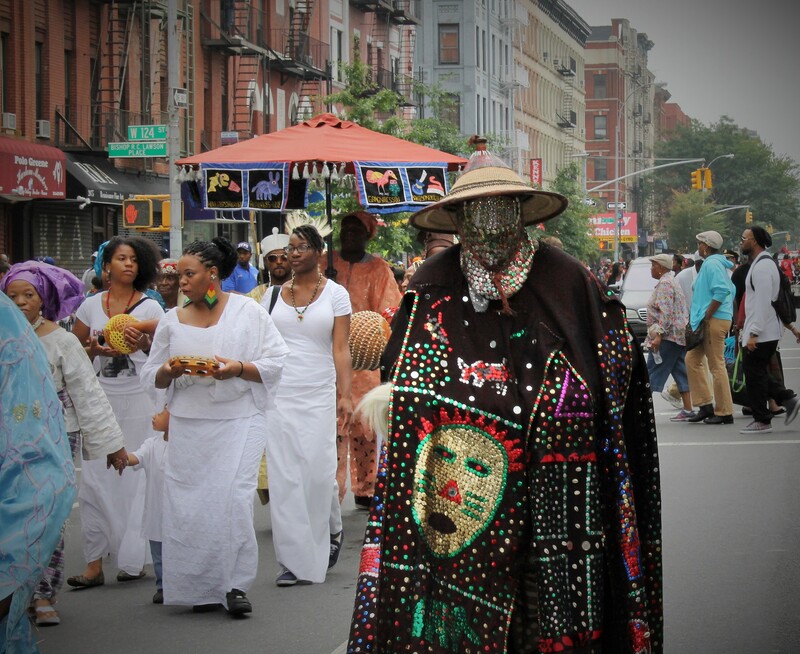 They have some great outfits and a great spiritual message. 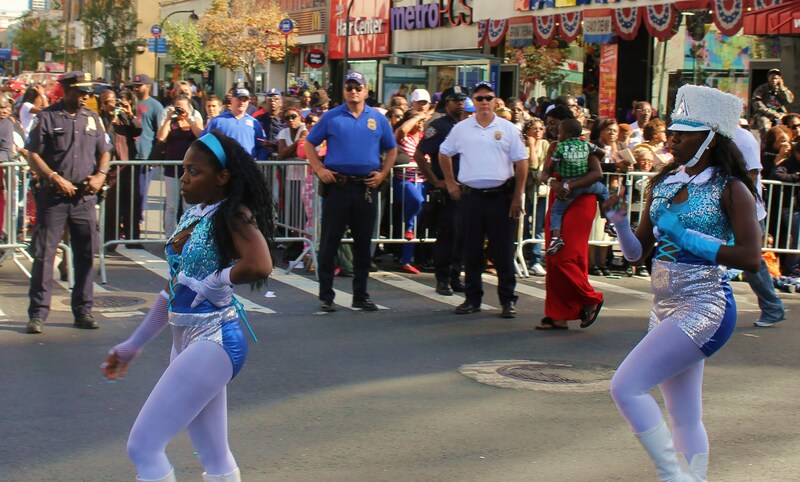 Right after them was a parade favorite, the Temple Guard Drill Team. They always do a great job. 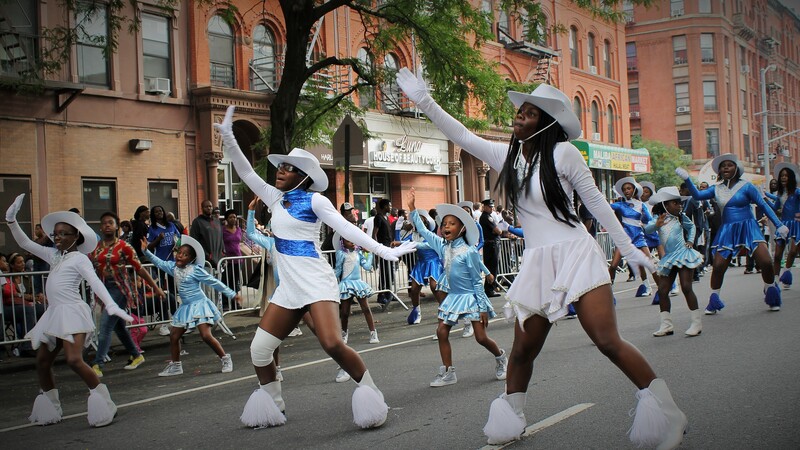 This parade is known for its high stepper coming in from Baltimore and this years groups did not disappoint. Kicking things off were the Christian Warriors. A nice treat was a group from both California and Baltimore that merged groups. 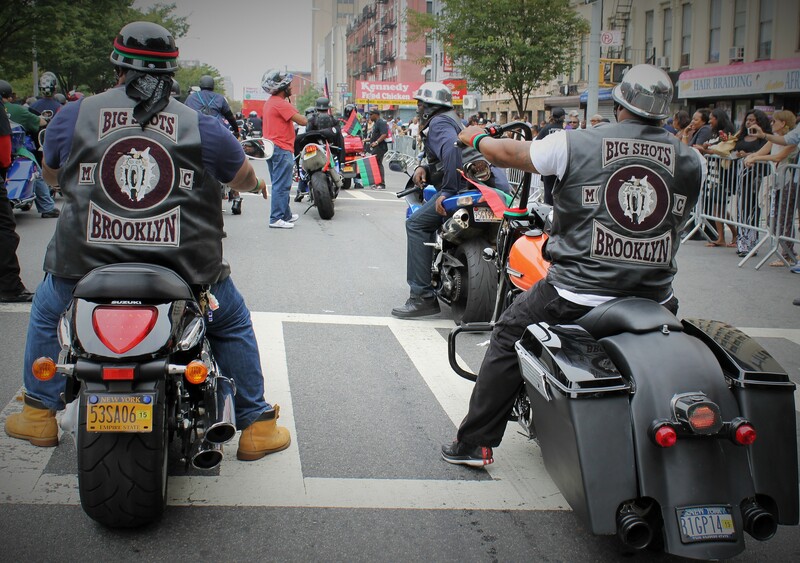 The West Coat and East Coast Westsiders put on a good show for the crowd. 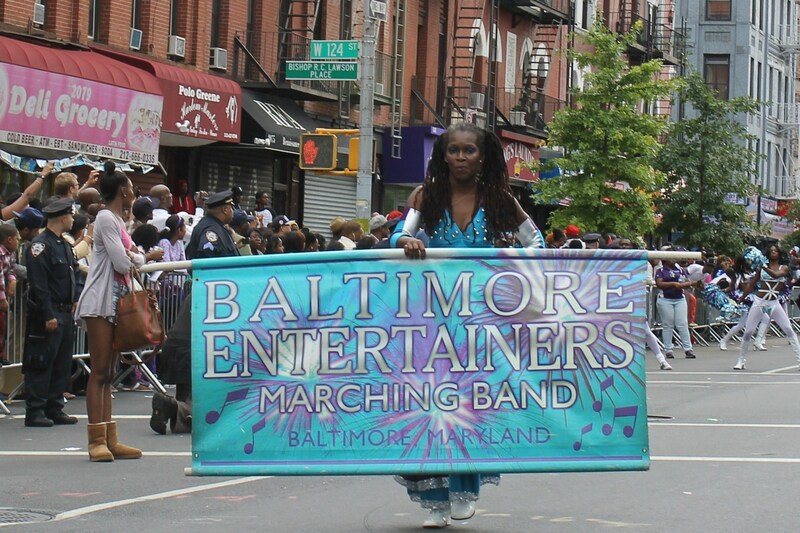 The group that really put on a great show were the Baltimore Entertainers. They got the crowd worked up. Not to be outdone though were the Baltimore All-Stars and Mass Destruction. 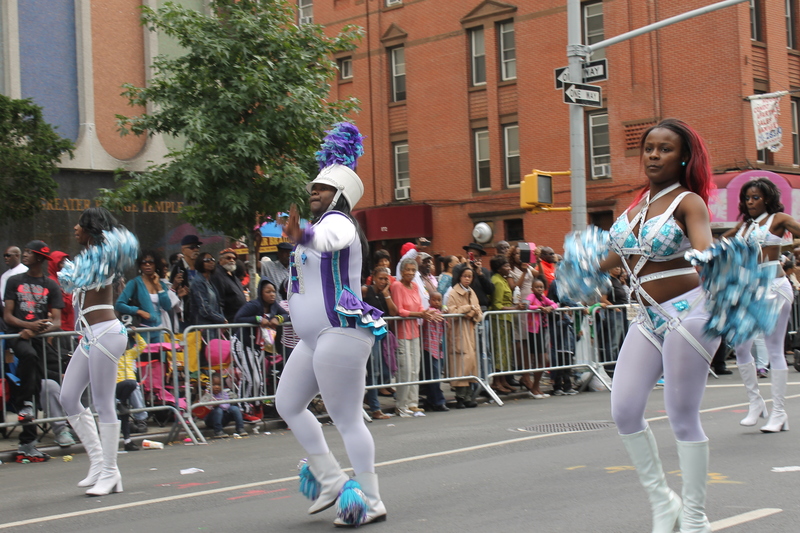 They all had great costumes, a fierce drum line and some energetic dancers. 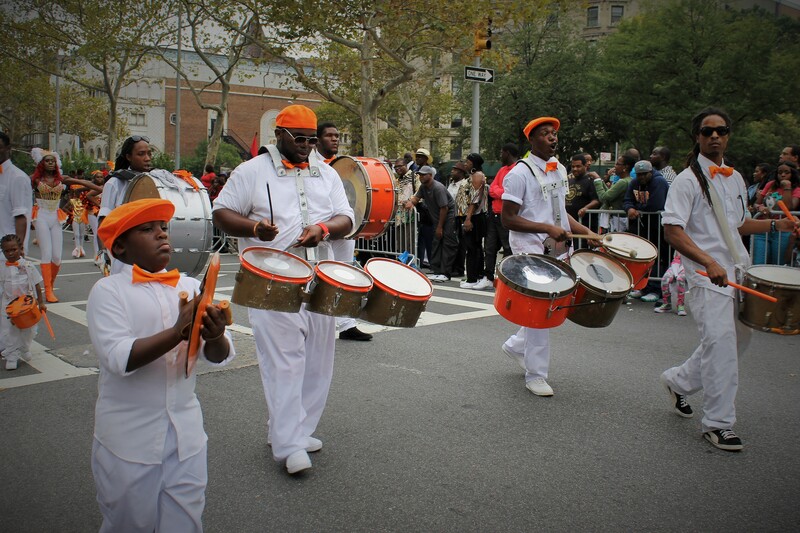 This was a fun parade with lots of drums music and positive messages. 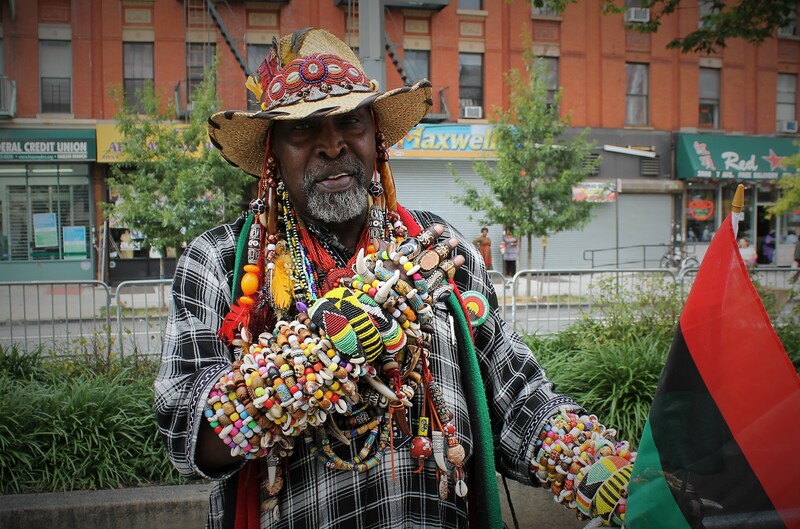 Of course, when in Harlem step on over to any one of the great restaurants in the area. Ruthie’s always gets my vote. Best fried chicken recipe in the neighborhood. 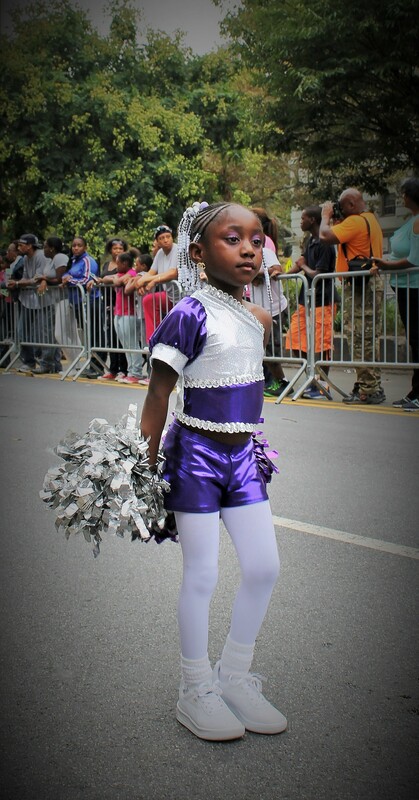 Billed as the largest African American Day parade in the country, this past Sundays salute to African American heritage, culture and contribution to America was alive and kicking in high gear. 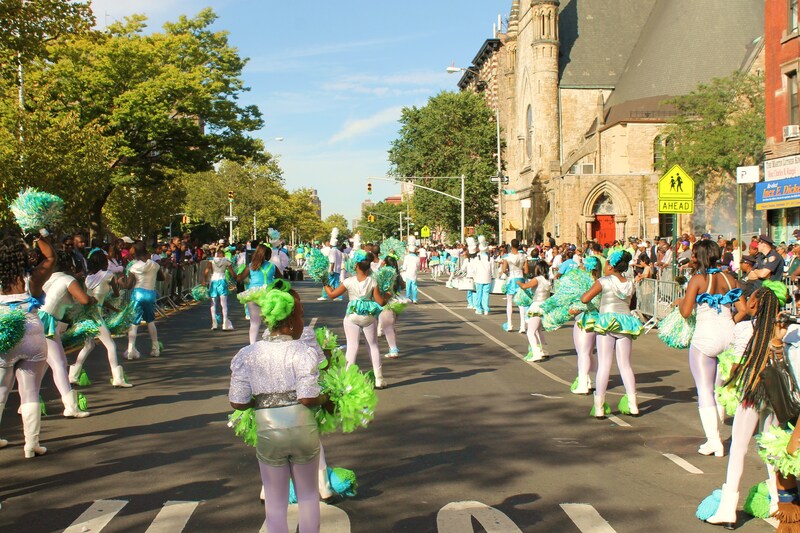 Although the parade was competing with the largest People’s Global Climate March in the world, the streets were still lined up with thousands of revelers looking to see marchers, dignitaries, and some of the best steppers from around the country. 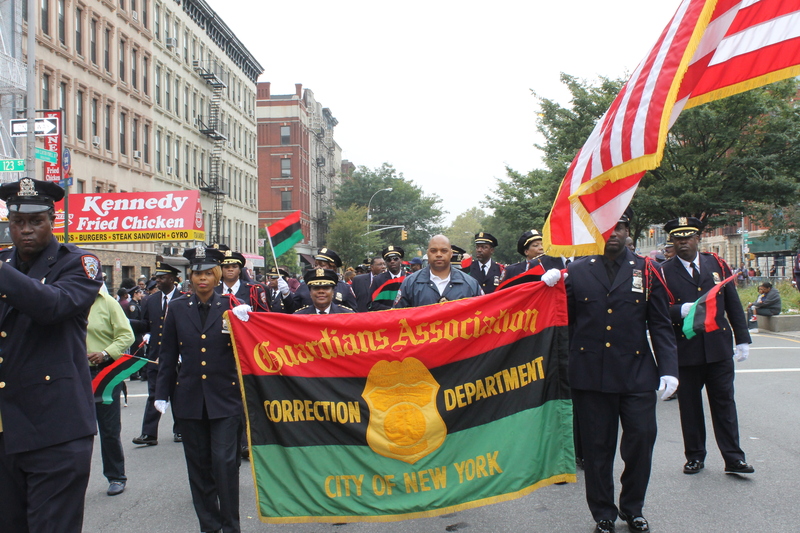 The 45th annual parade always sends positive messages to the community and more importantly brings awareness of injustices that have happened. 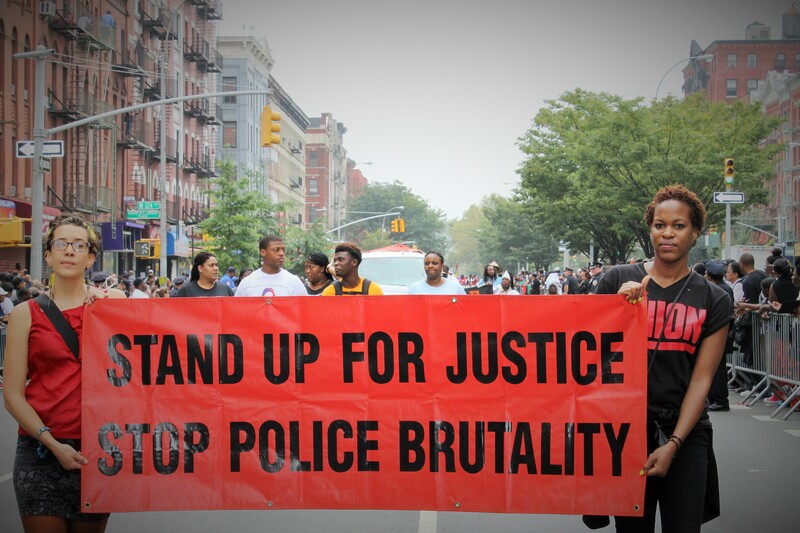 Banners demanding an end to police brutality and a demonstration set for October to protest police tactics were prevalent. 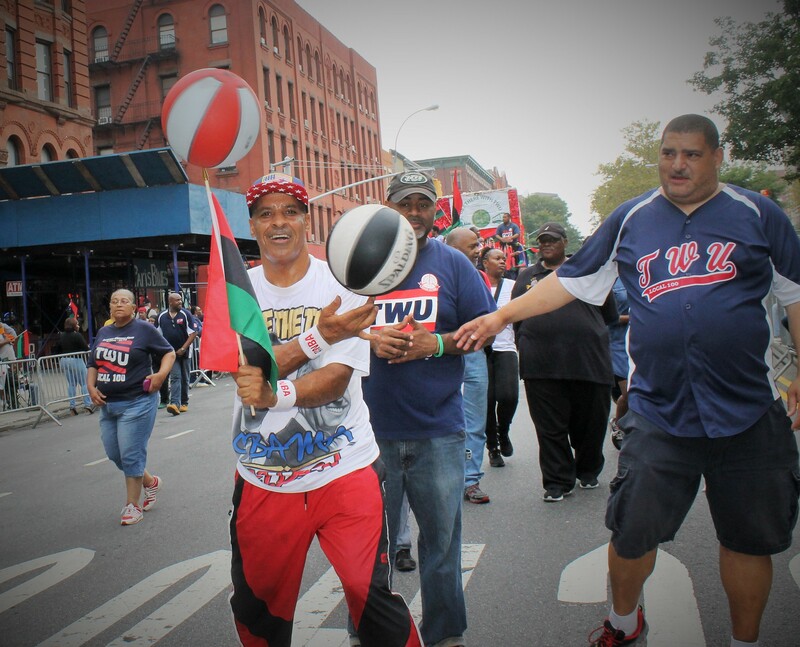 This was also a day for celebration as many unions participated to show unity and strength in the face of a wave of efforts to block and weaken workers on a national level. 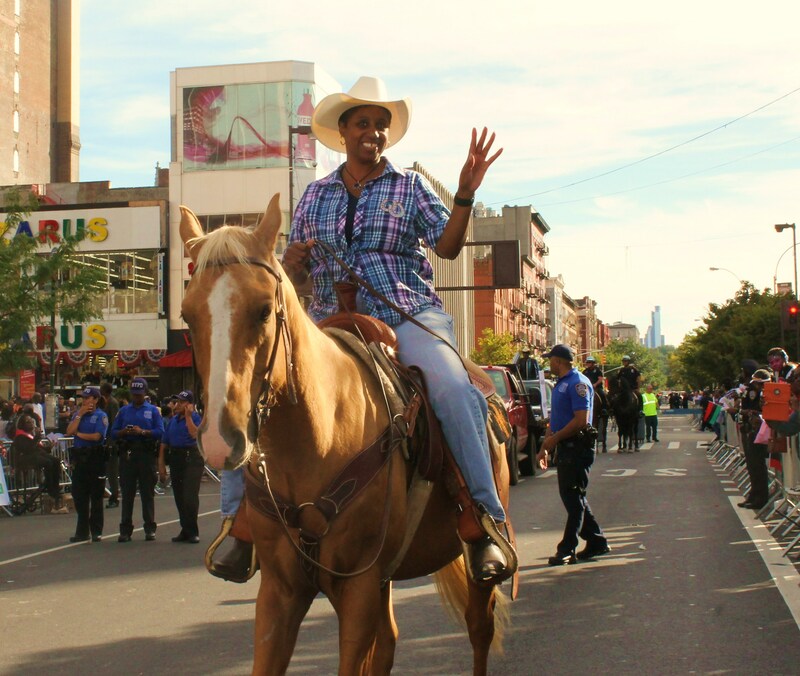 Mayor deBlasio was well received for his efforts to reach contractual agreements with union workers, one the previous administration had difficulty doing. The Rev. Al Sharpton and Mayor David Dinkins were applauded for all their hard work to bring a voice to those that have suffered some injustice. Then the fun started when he first of several steppers arrived. 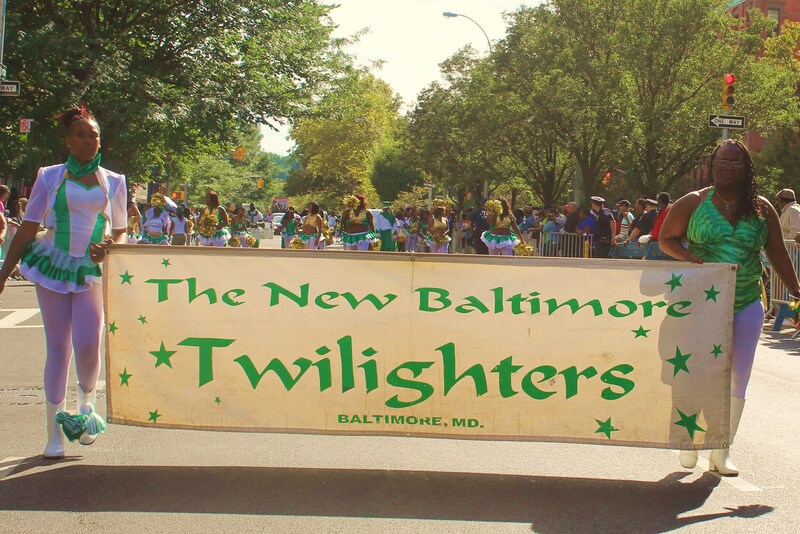 The Baltimore Westsiders showed off their moves to the grandstand at 125th and Frederick Douglas Blvd. 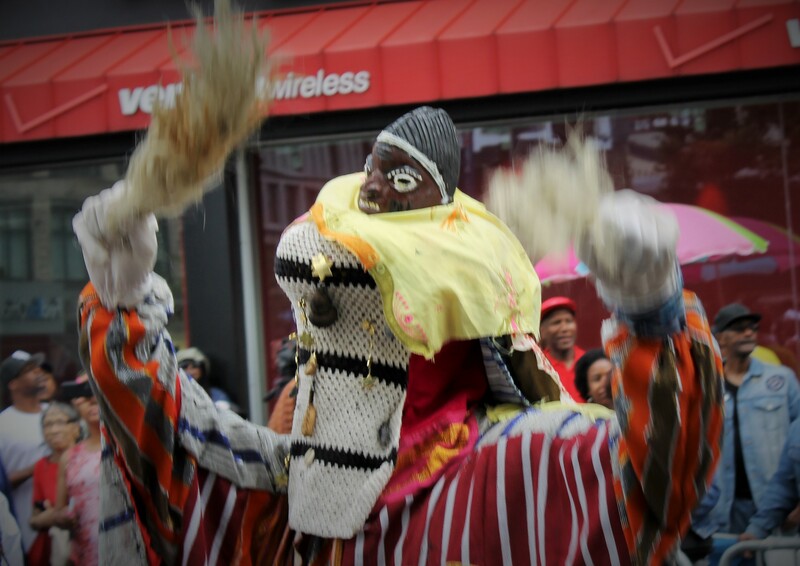 The Yoruba African group danced their way up the parade group with some unusual costumes. 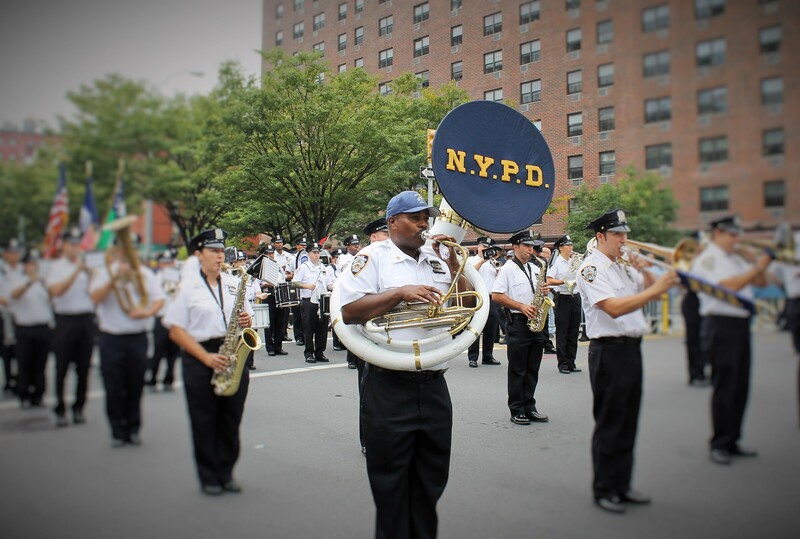 Ironically they were followed by the Christian Warrior Marching band. They were pretty good. 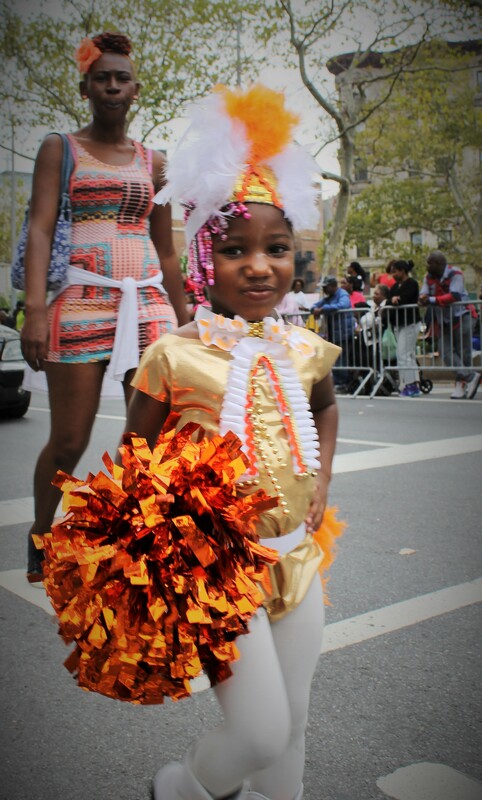 One of the steppers with the cutest kids were the Mission Drum and Bugle Corp. 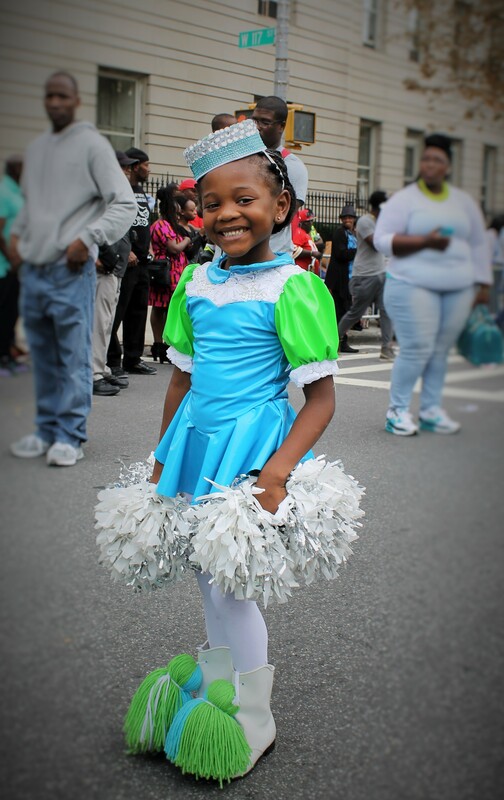 The little girls in their 50s throwback costumes brought smiles to the faces of many in the crowd. 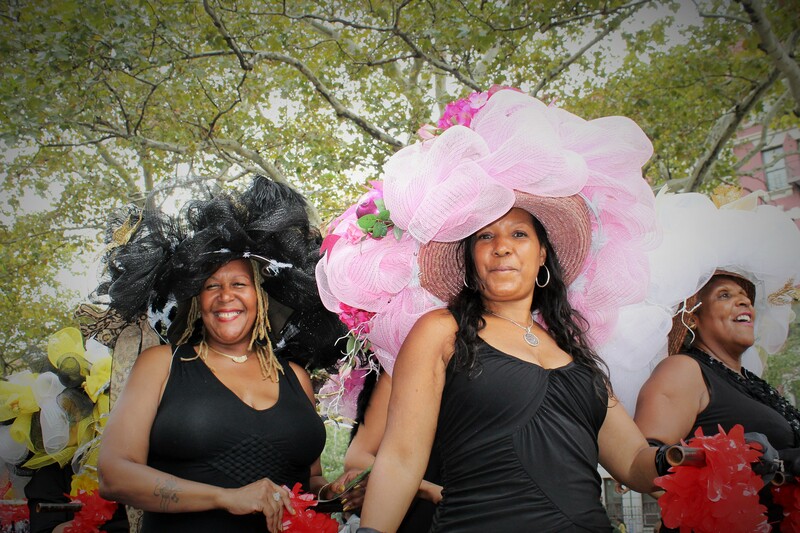 The various motorcycle clubs roared up the parade route while the ladies in bonnets brought some fashion to the party. 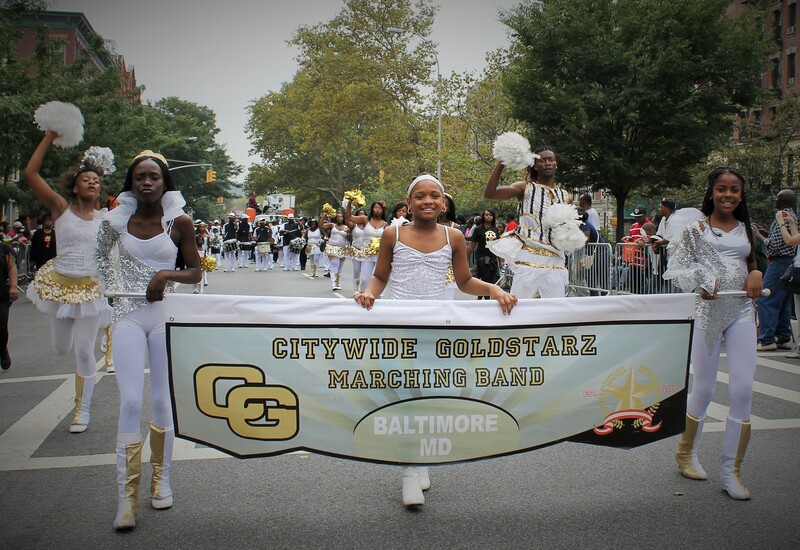 Getting the crowd warmed up some more were the Citywide Goldstarz with their energetic leader and the Marching Elite with their jazzy style. 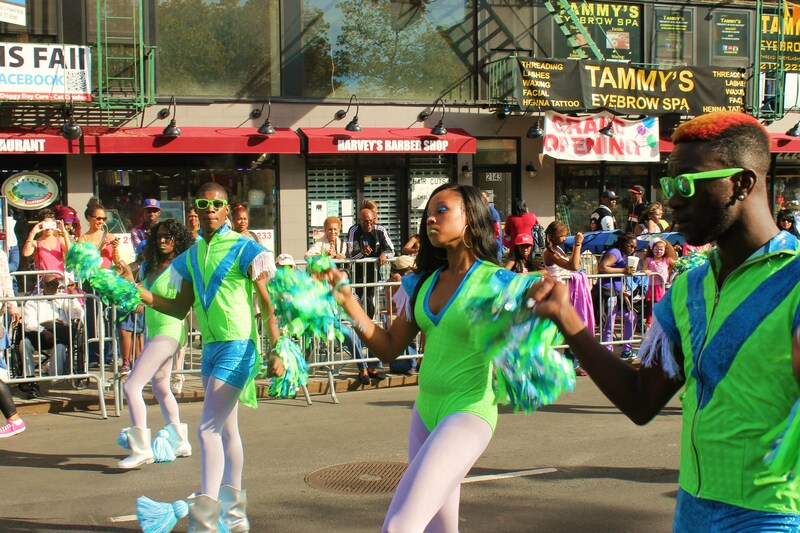 A new addition to the parade were a hometown stepping group that really worked the crowd with their tight moves. 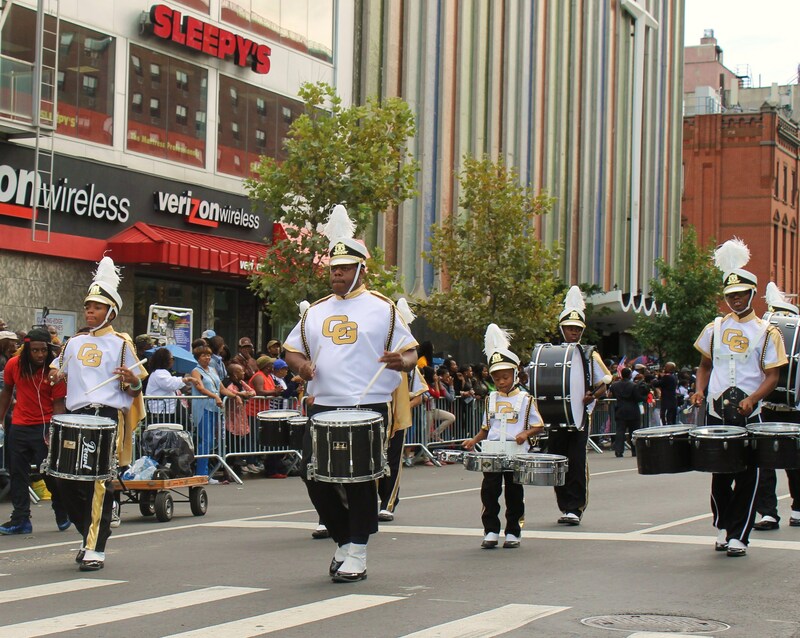 The Marching Cobras set the tone for the rest of the parade and were the benchmark for other groups to follow. 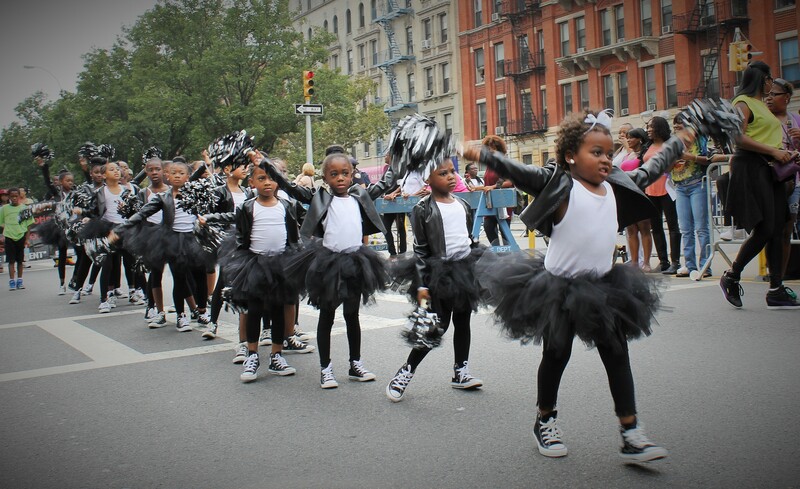 The acrobatic FAO-TOR group kept the energy level on high showing off their cheerleader moves. 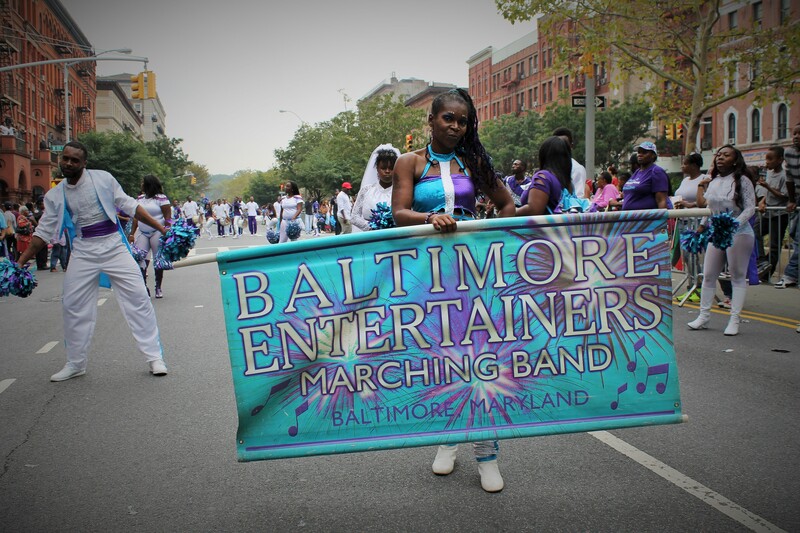 The Baltimore Showstoppers lived up to their billing and gave the crowd a thrill with the great choreography and booming marching band. They tore it up. 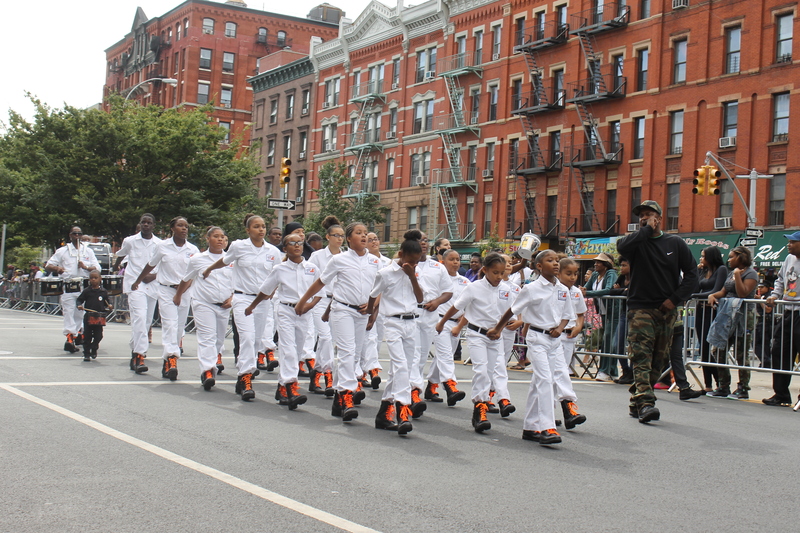 Closing out the steppers was a dynamic group from Baltimore…Mass Destruction, yeah they killed it. Their high energy and focus was unmatched. 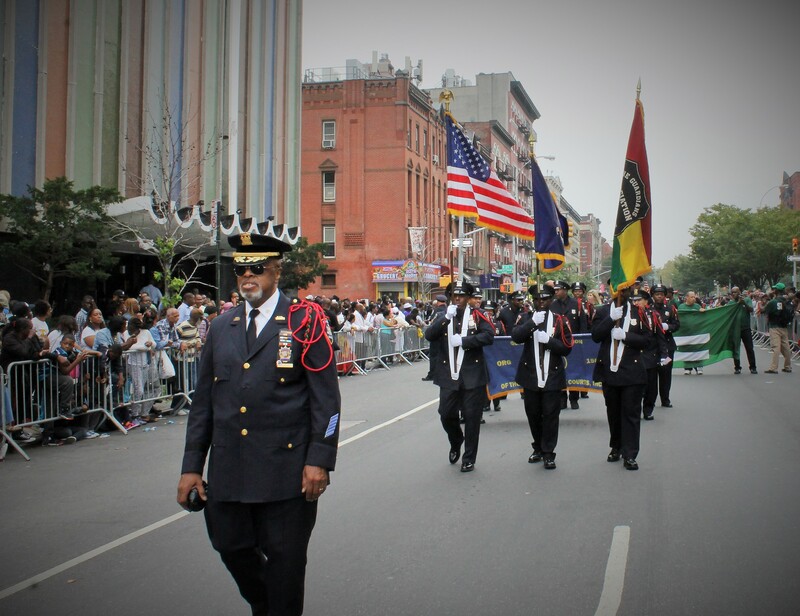 Once again the parade was a major success and was a fine display of African-American pride, culture, unity and strength. 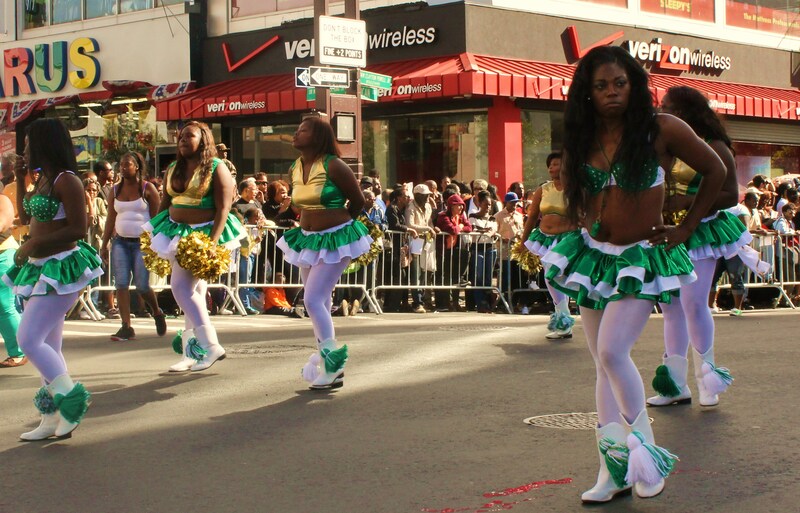 Parade revelers were lining up on the sun filled Sunday afternoon on Adam Clayton Blvd. 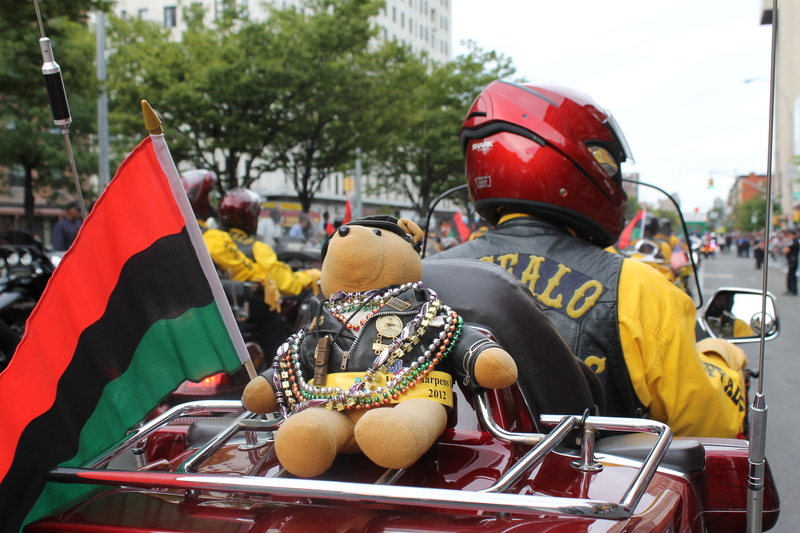 waiting to see the start of the largest African American parade in the country. 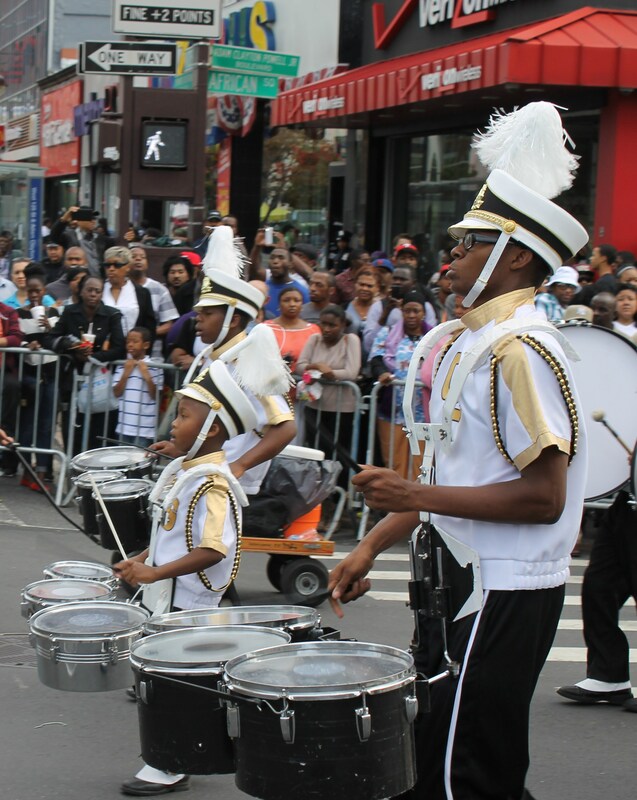 Marching bands and organizations from over 12 states walked past the shadow of the world famous Apollo Theater with pride, dignity and respect for each other. 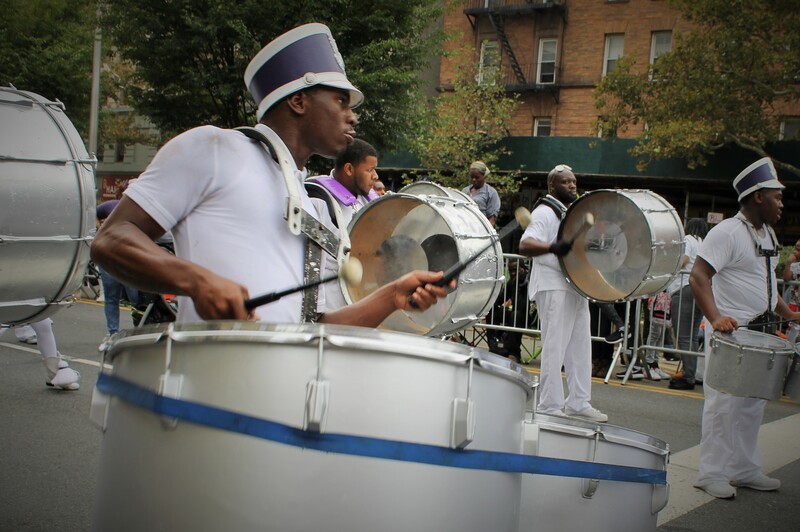 The 44th annual celebration of African American heritage and culture began differently from previous years as the usual marching band from Cheney University was absent. No worries though as the Camden HS Marching Band made up for it and played loud and proud. 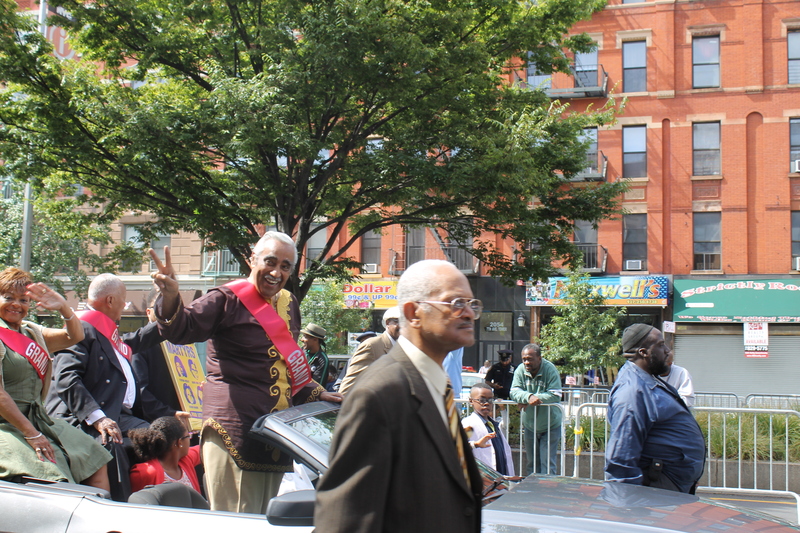 Parade organizers and local politicians including Congressman Charles Rangel and former mayoral candidate Bill Thompson waved to the crowd to get things started for a fun filled day. 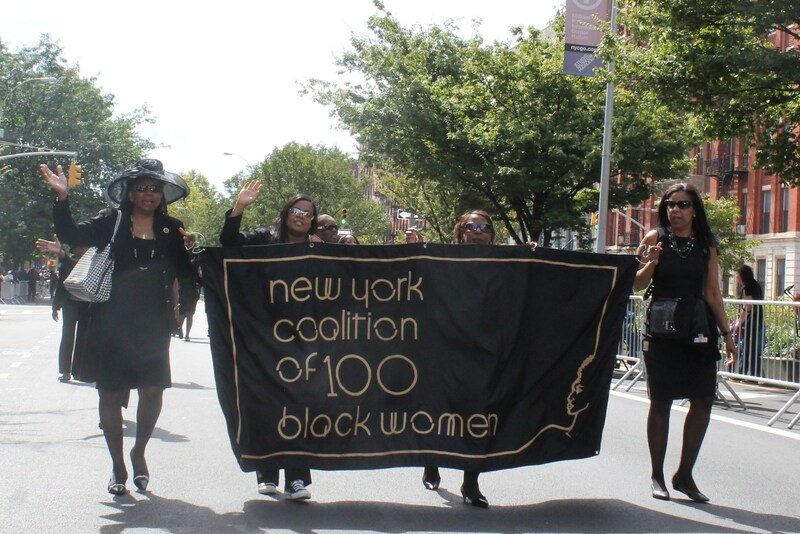 This year the women’s organizations came out strong to support women owned businesses and educational organizations supporting higher education. 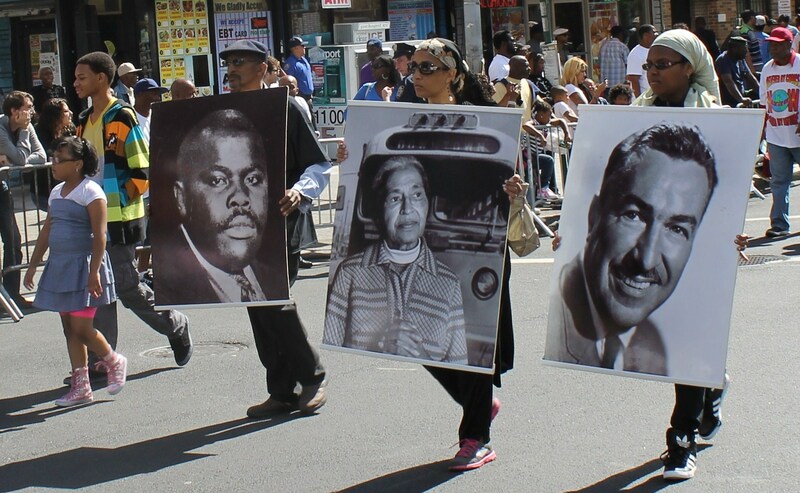 Every year large photos of the heroes of the community are carried as a reminder of the sacrifices that were made long ago to advance the cause of justice and freedom for today. 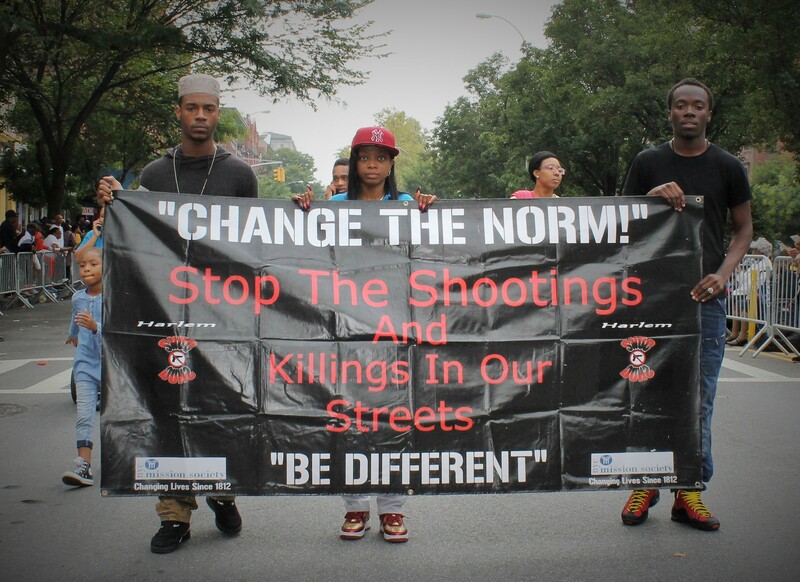 Soon after came a group calling for a boycott of Florida and justice for the tragic death of Trayvon Martin. 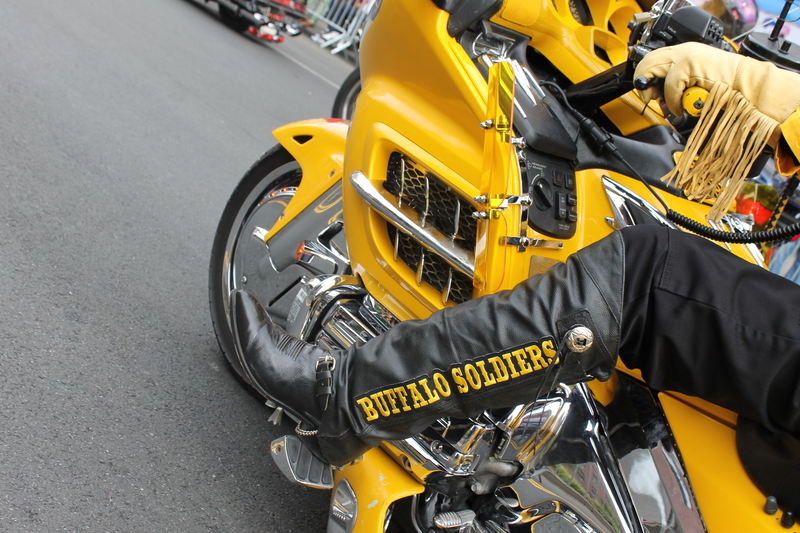 A different take to the parade this year were the Buffalo Soldiers riding in on their stylized cycles. 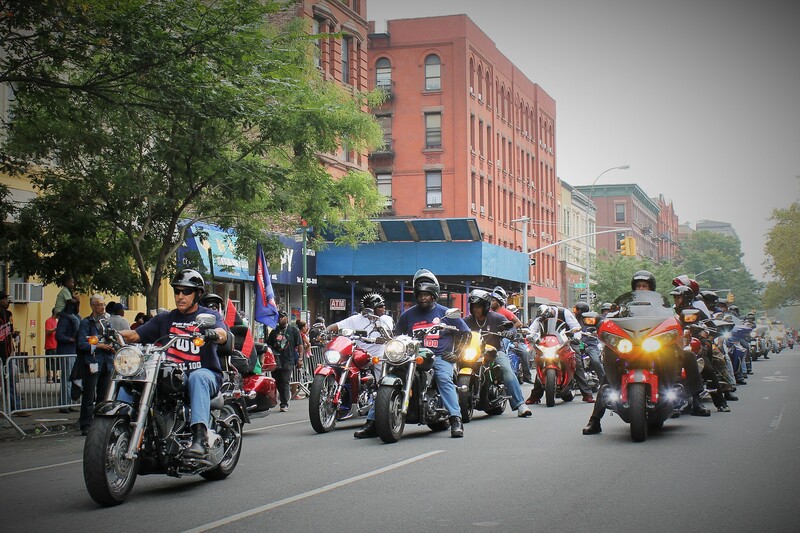 The crowd woke up some especially when some hit the throttle and made some thunderous noise. Guess it was a nice introduction for what was to follow when the first of several marching bands came down the parade route shaking things up. 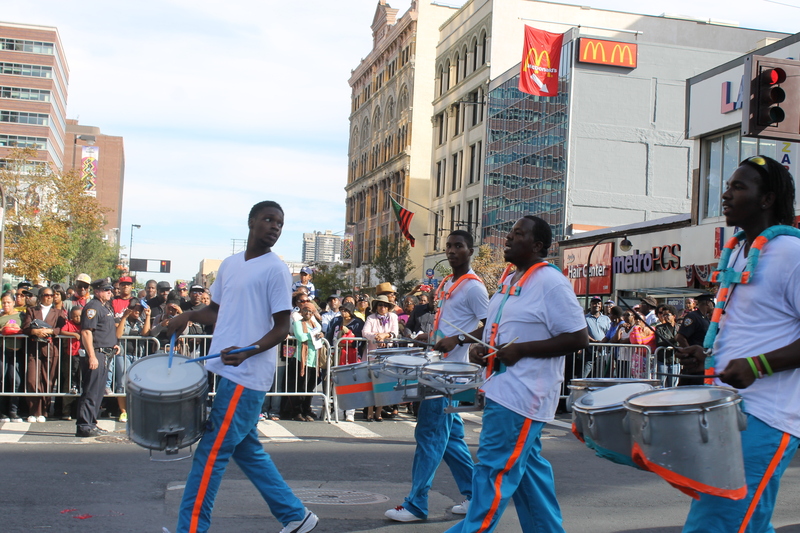 The Baltimore Entertainers got things under way with their heavy thumping drum beat. They were warming things up for the Baltimore Go Getters as they showed off their dance moves but wait it keeps getting better. 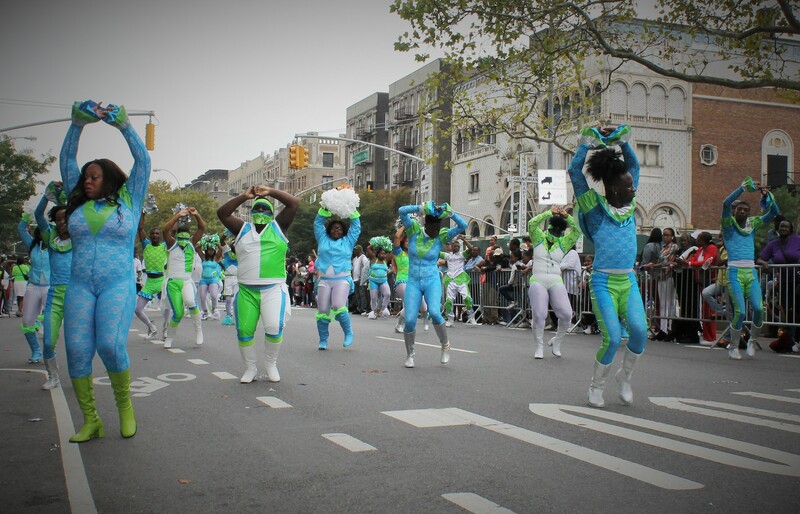 As the New Baltimore Twilighters were making their way up the parade route one of the dancers spotted Mickey Mouse trying to steal their thunder and hopped over the fence to show him how shake it in Harlem. A smaller group called The Band had a really high energy show for the crowd. 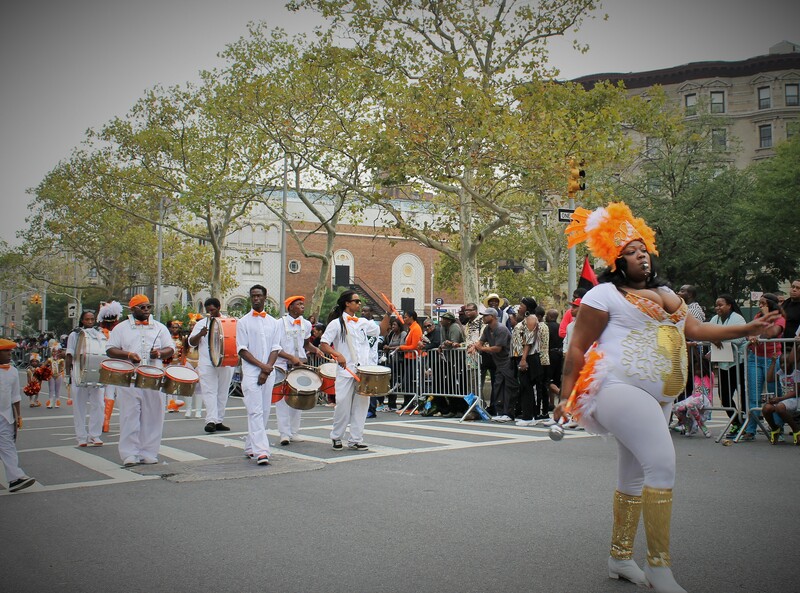 The band that got the most praise from the crowd though had to be the Baltimore Westsiders. They really tore it up. 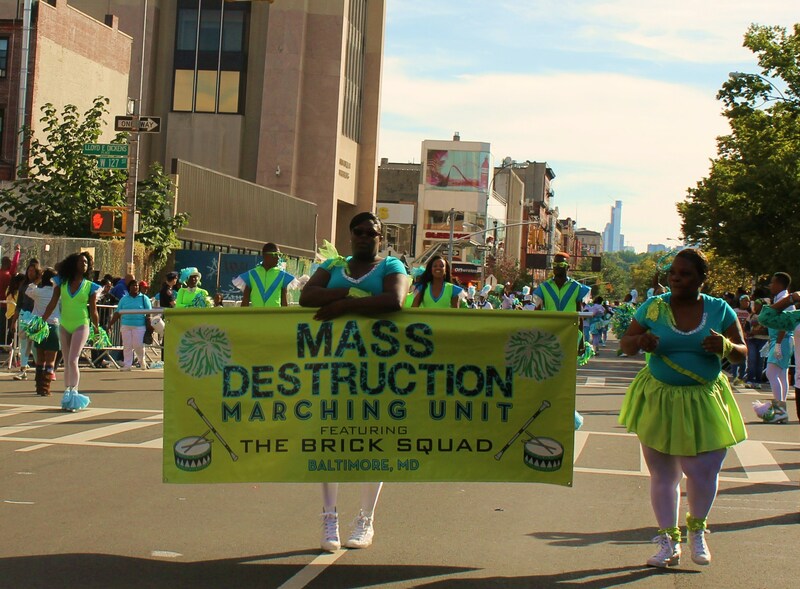 Not to be outdone was the colorful and high energy band of Mass Destruction. Closing out the proud display of high stepping bands were the New Edition. 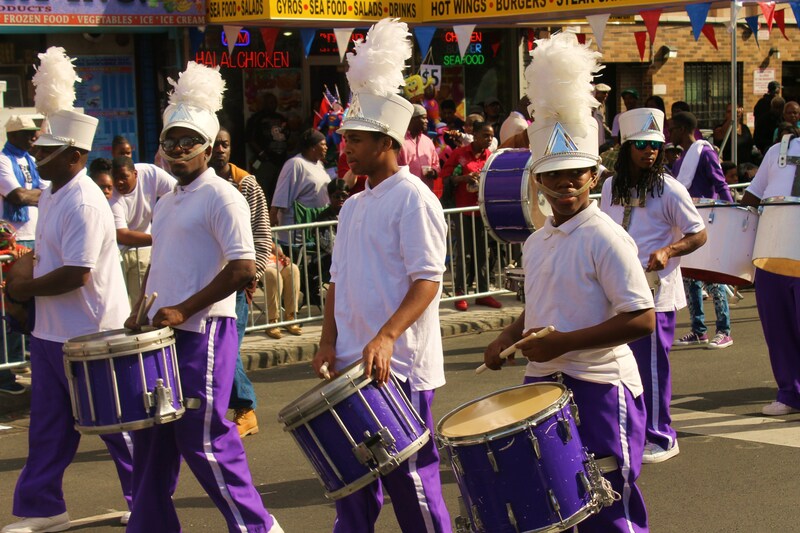 I think the had the best drum corp of all. 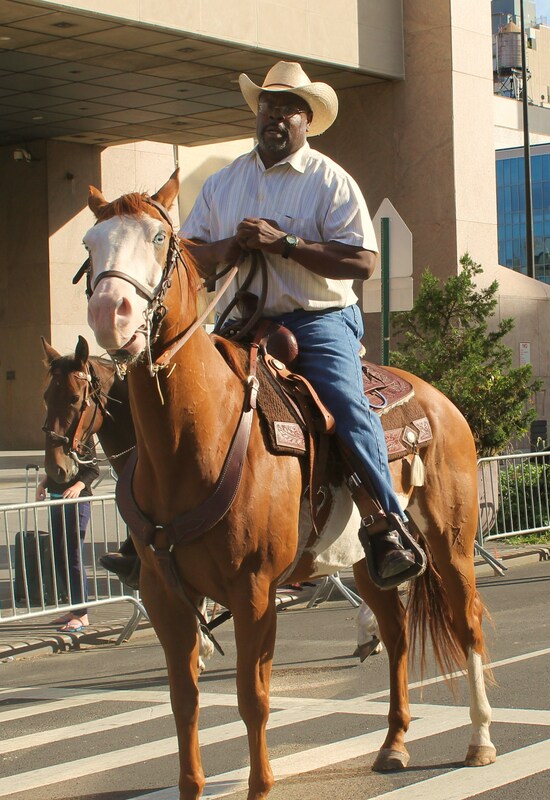 As a tradition the parade closed out with black cowboys and their beautiful horses. 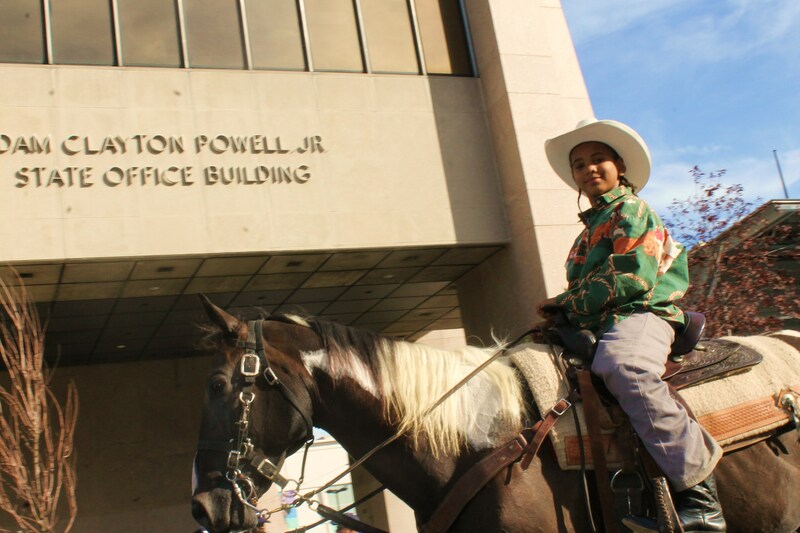 A nice treat for any city kid from 4 to 94. This parade lived up to the hype. Great job all. 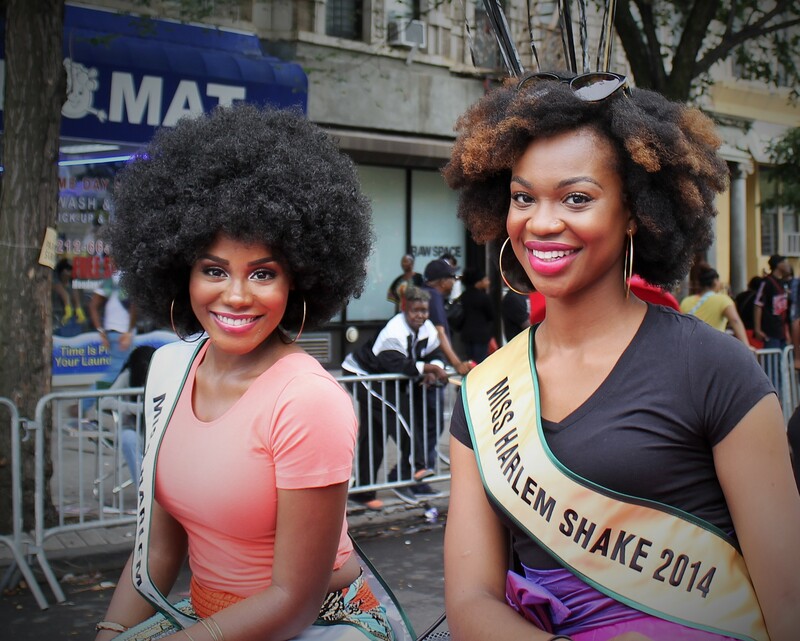 In the shadow of the legendary Apollo Theater on 125th St., Rachel and I made our way to the second leg of the parade weekend for the 42nd annual African-American Day Parade. 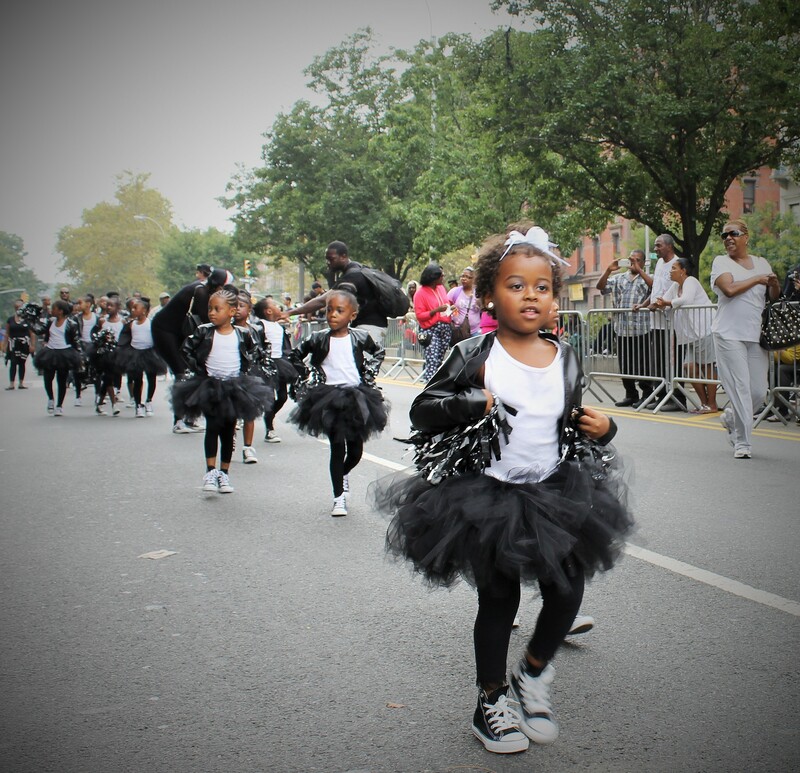 The parade is the largest Black Parade in America and celebrates achievement, education, and its many important contributions to American society. 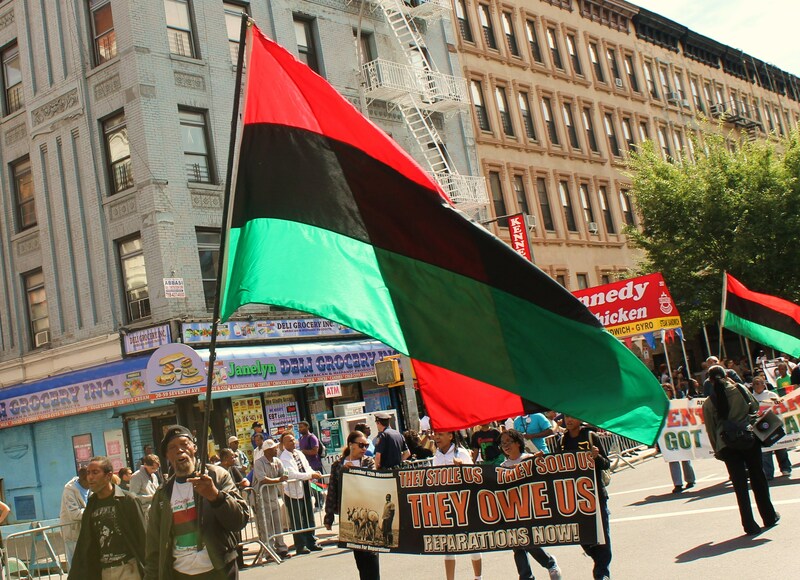 This years theme of working for unity, justice and economic empowerment couldn’t have been more timely as the tough economic times has hit the African-American community hardest. 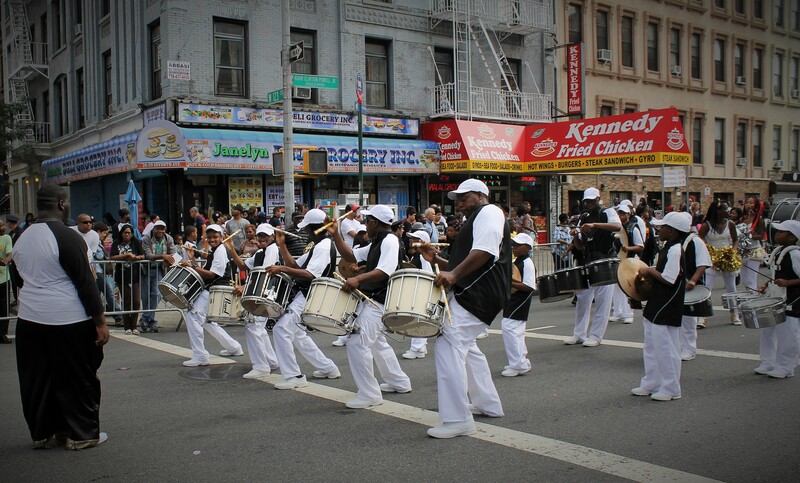 The parade route started at 111st St and Adam Clayton Powell Blvd. and ended at 136th St. The Blvd. started filling up with revelers close to 1PM at the kickoff. 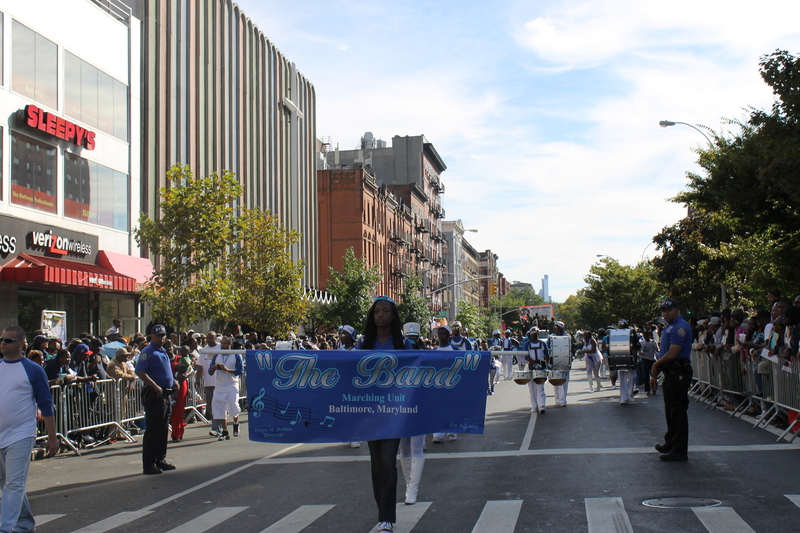 Aft er the Memo rial Parade Board float made its way up, the Cheyney University Band from PA., the nation’s oldest historically Black institution of higher learning, ushered in a day of marching and stepping and celebration. 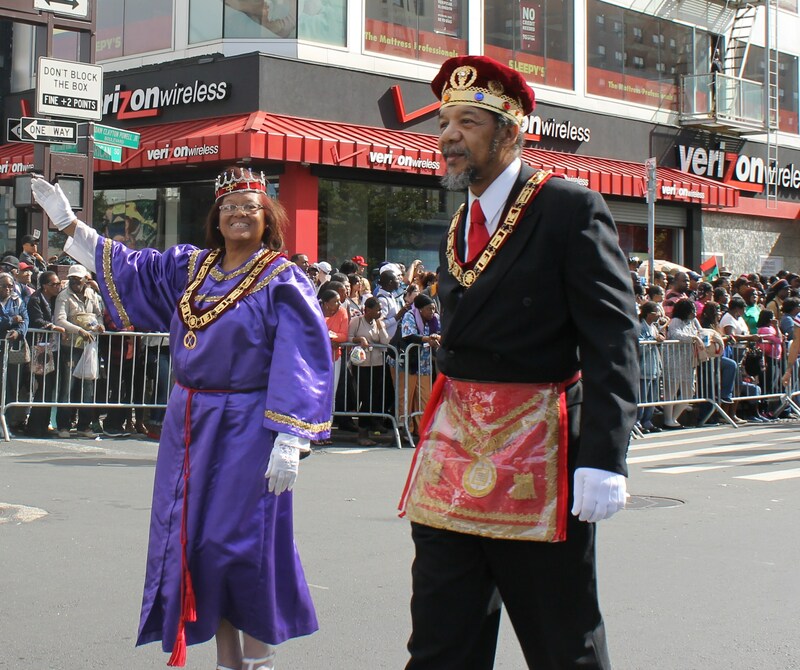 Grand Marshalls stopped by the WBLS radio station area on 125th St. where politicians and group organizers would address the crowd with uplifting and encouraging messages. Rev. Al Sharpton drew the largest attention while NYC comptroller John C. Lui was politicking for what could be a potential mayoral run. 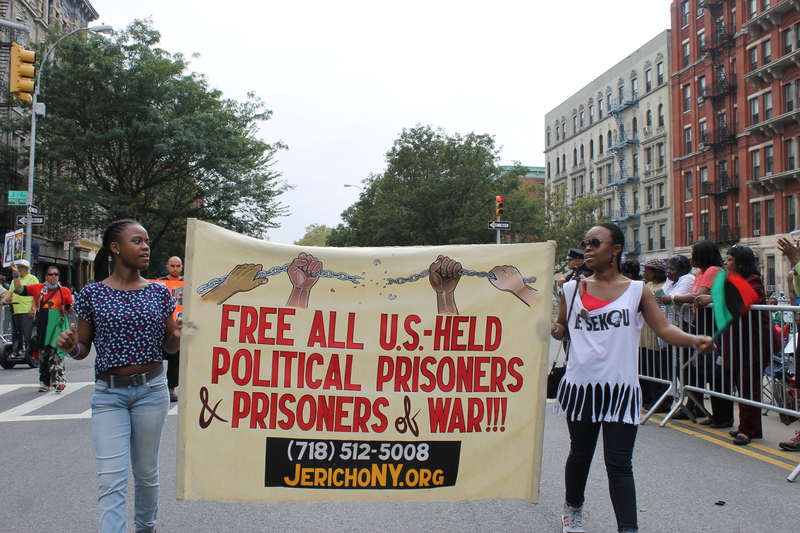 As the politicians made their remarks, the marchers were stalled and eager to march and show off their organization. 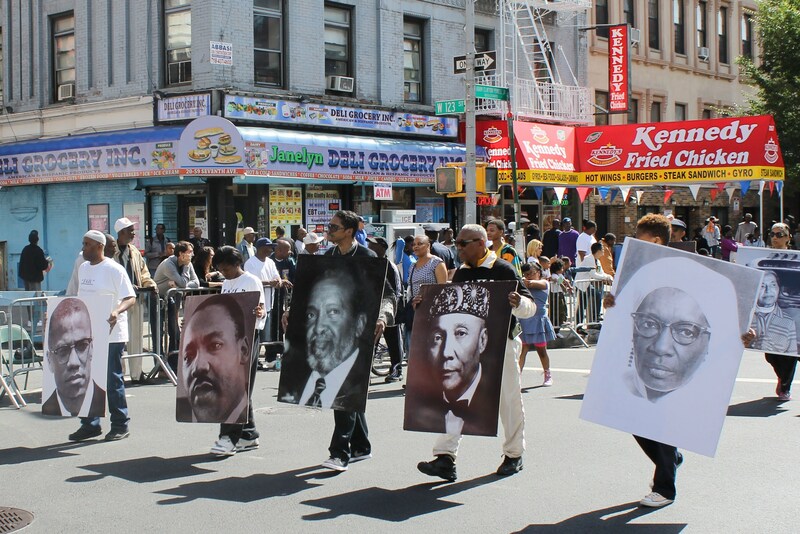 One of the most impressive displays were Masjia Malcolm Shabazz holding large pictures of former leaders with pride and a reminder of the history and sacrifice made for the community. 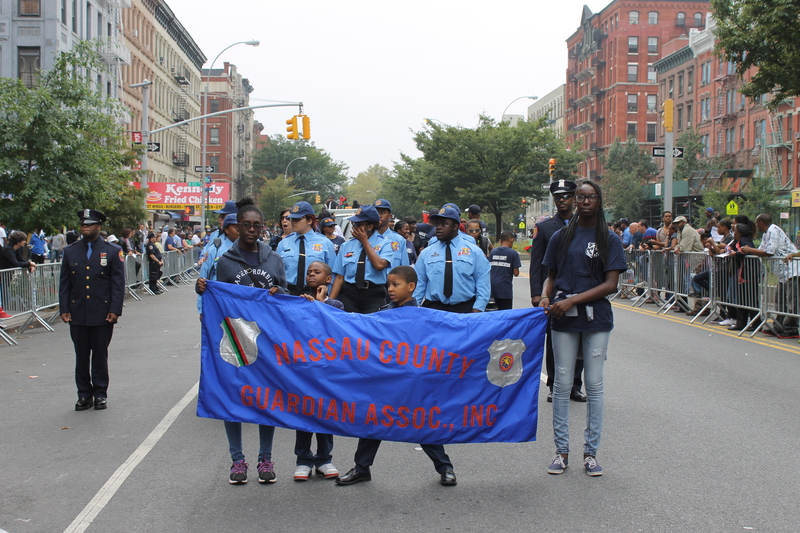 Things picked up and the parade flowed better while marchers passed by WBLS radio personality Bob Lee as he announced each group including the NY Police Guardian Association, the Baltimore Westsiders and Local Unions. 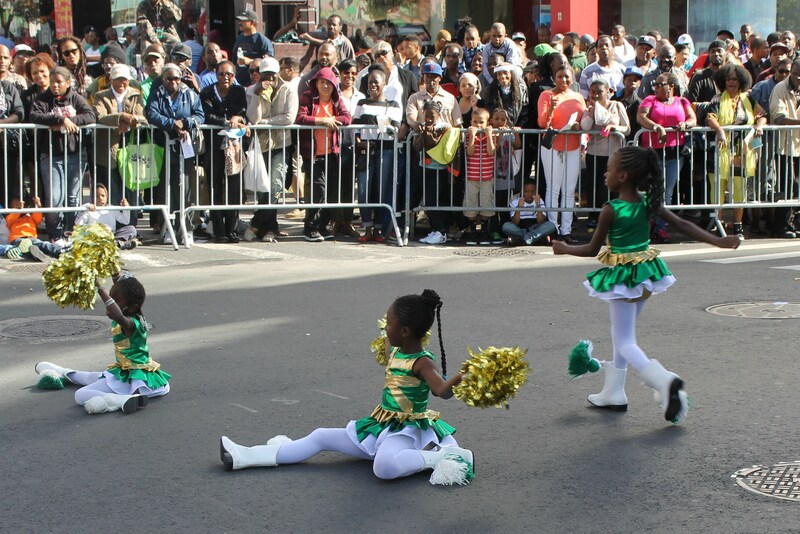 Then the high steppers from all parts of the country showed off their moves that made the crowd happy. 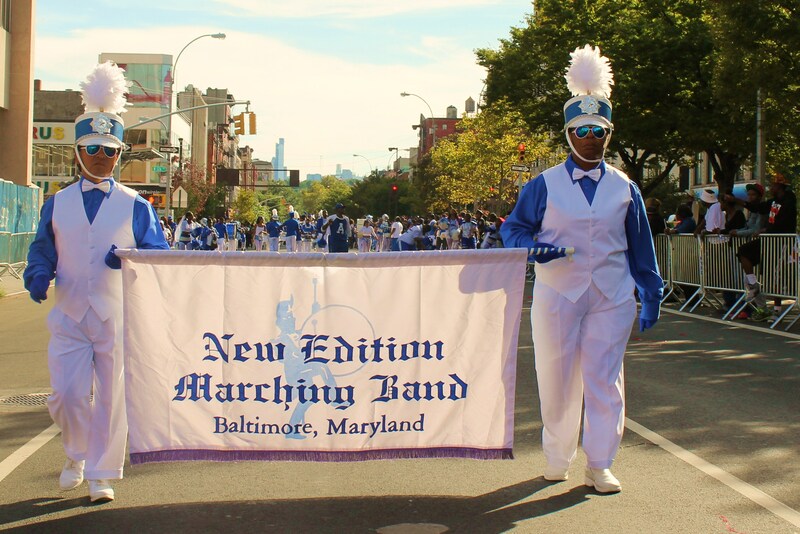 Kicking things off were the Temple Grand Drill Team from PA marching in precision followed by New Edition Baltimore Marching band adding their fresh style to the parade but not to be outdone by the Baltimore Entertainers. 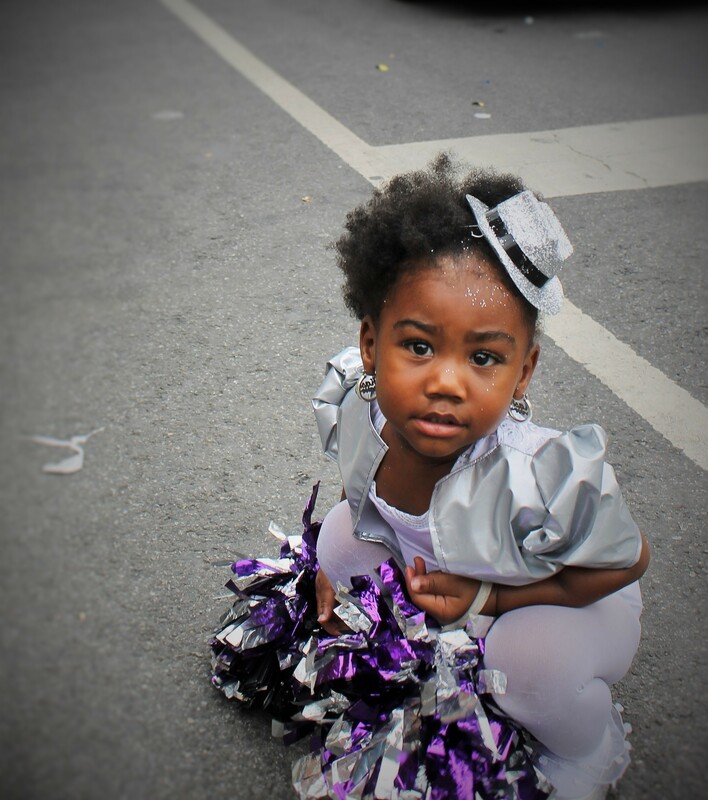 However, a show stealer came from Parks and Recreation group with a toddler girl who showed Bob Lee how she danced. The crowd loved it. 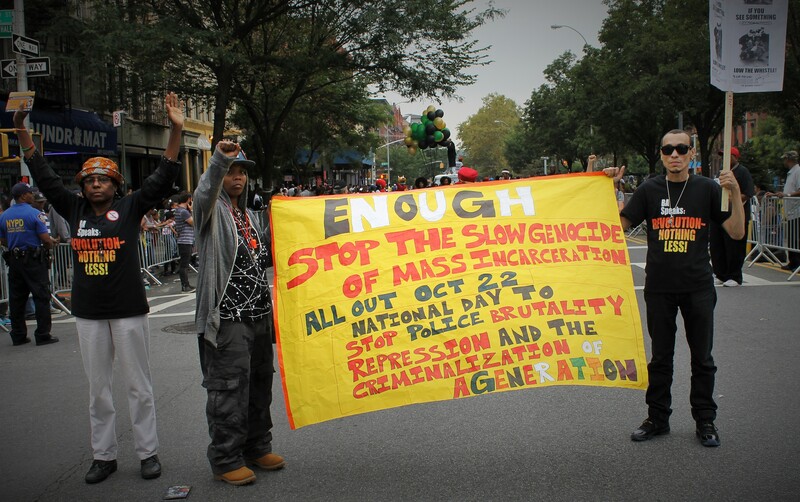 There was a break from the steppers as groups of marchers with educational and empowerment messages gave out pamphlets and raised banners of injustices. 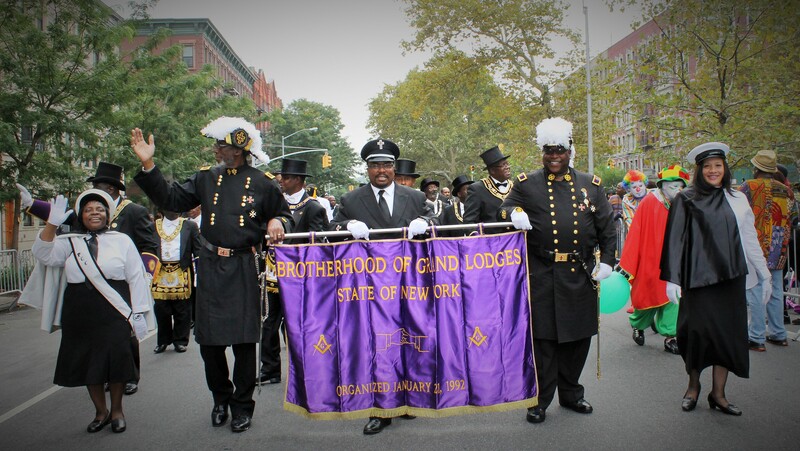 Various Masonic groups and Greek Orders from various colleges and universities marched as a sign of unity and strength. Many groups addressed the crowd to give positive messages to take home. Things picked up again when the Show Stoppers marched up style. 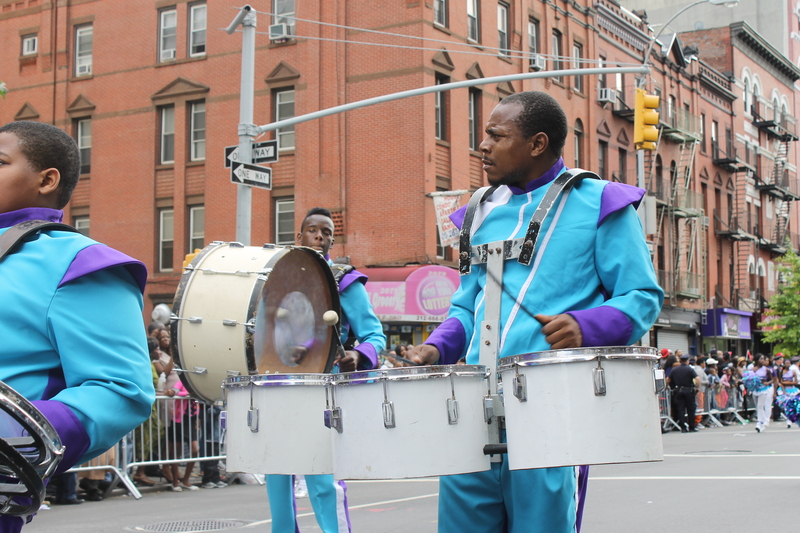 A classy marching band was the group from marching band from Brooklyn representing Panama. 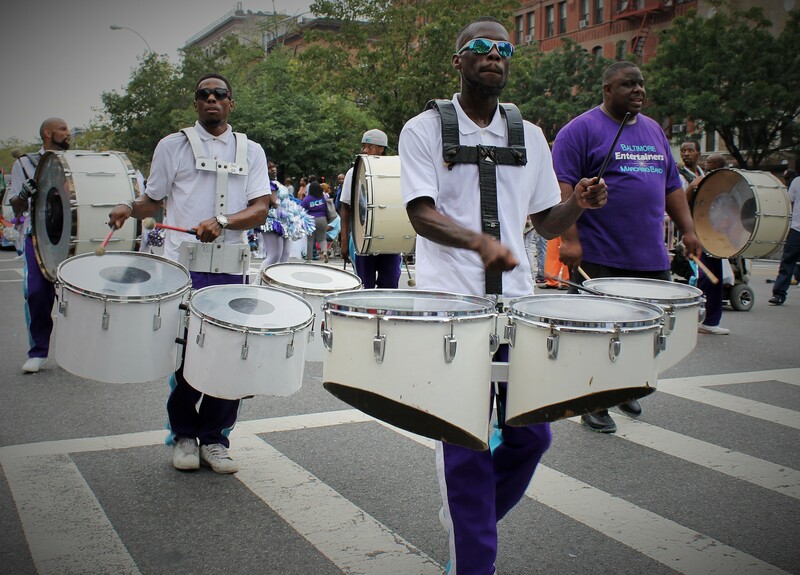 Saving what could be the best for last were the Baltimore All Star Marchers. They impressed the crowd so much, some young gals were asking how they can join them. 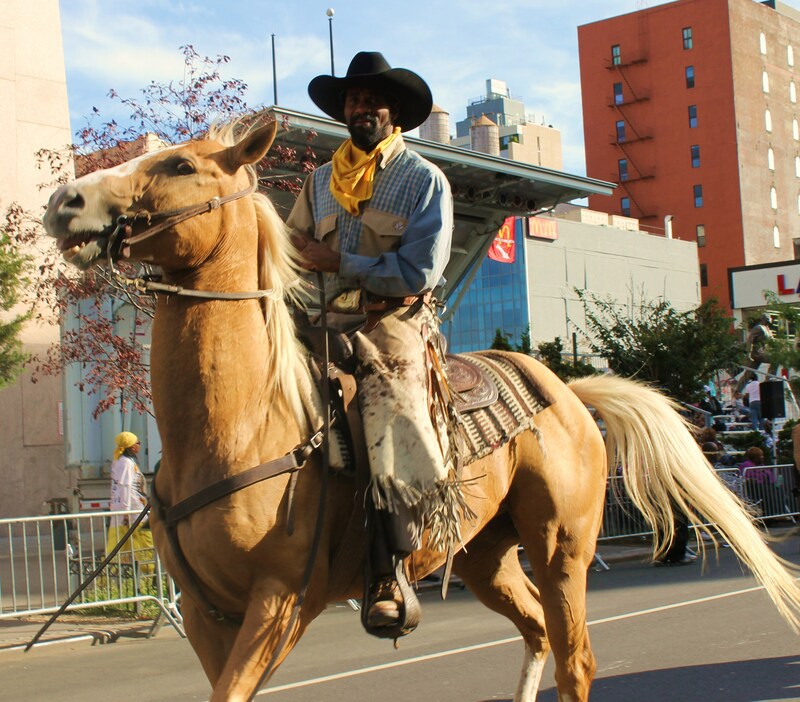 Closing the parade were the crowd pleasing Federation of Black Cowboys riding their well-trained horses and allowing children to pet them. Rachel and I met up towards the end of the parade and agreed this was one of better parades we had been to this year and had to stop by Amy Ruth’s for some authentic Southern style cooking. 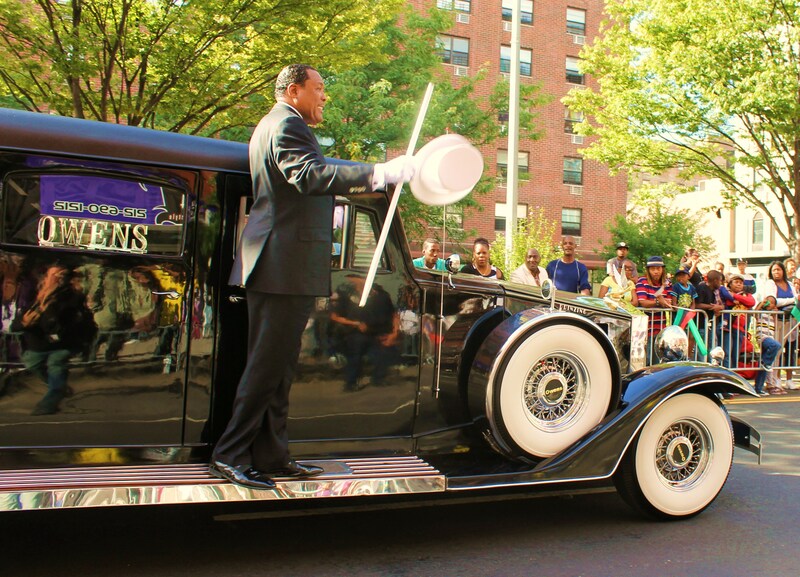 A fitting way to end a fun day in Harlem, USA.